Postage and packaging $3.50 per order. Make sure you provide your name and mailing address, identify which items you want, how many, and the total amount of the purchase. Payment can be made by depositing the full amount to Bank account Blenheim175 Trust 38-9012-0807494-03, with your name and initial to identify your payment. Items will be sent within approximately two weeks of your payment being received. Follow the links to find out about purchasing the book, “The Blenheim People” and photographs from the Whanganui Dinner. A book has been published to make available the contents of this website. This book provides more facts about the people who came to New Zealand on the Blenheim. 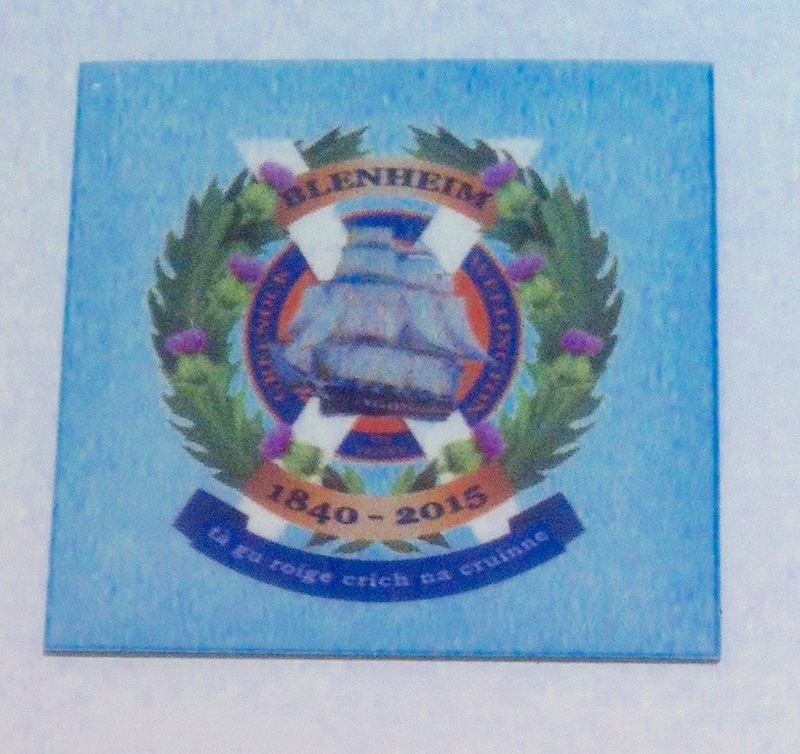 It is a snapshot of the information on www.blenheim175.wordpress.com as at the time of publication, and is published as part of the celebrations marking the 175th anniversary of the voyage. 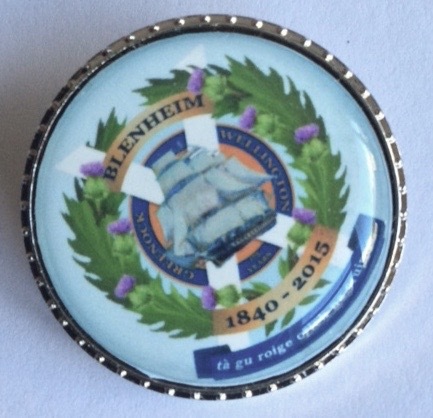 The information about each of the families and individuals who travelled on the Blenheim is based on official records and contemporary newspaper reports where possible, and has also benefitted from a number of family histories that have been published. 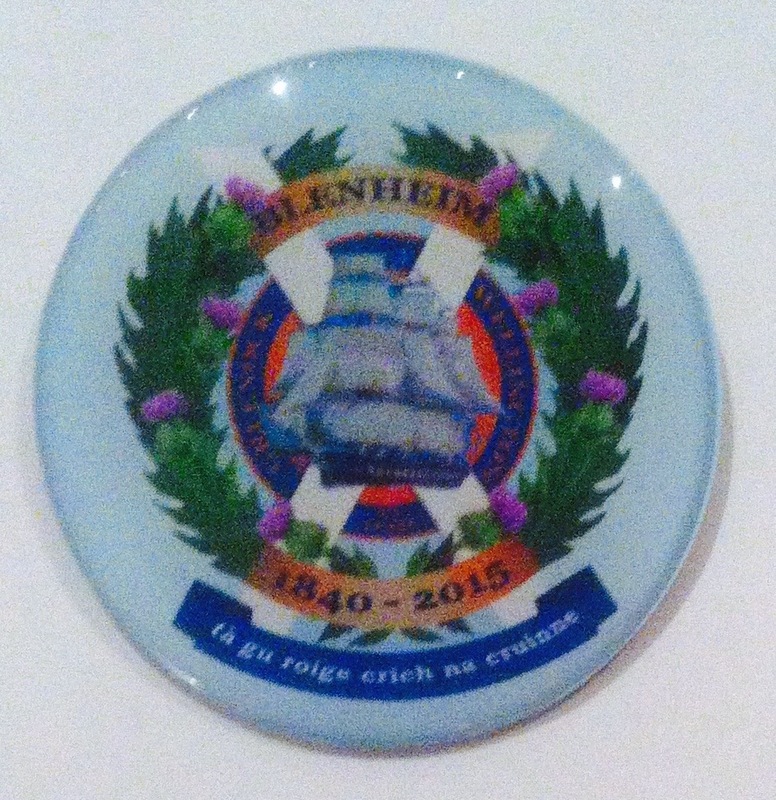 The focus has been on those who travelled on the Blenheim, not on subsequent (or earlier) generations. The stories are told mainly through newspaper accounts, often obituaries, or are taken from memoirs and journals written by or about the passengers. The book includes Jessie Campbell’s Journal and Letters. The book is A4 size, soft cover and wire bound, with 290 pages fully indexed. The price per copy is $25 plus postage and packaging of $6.50 in New Zealand. 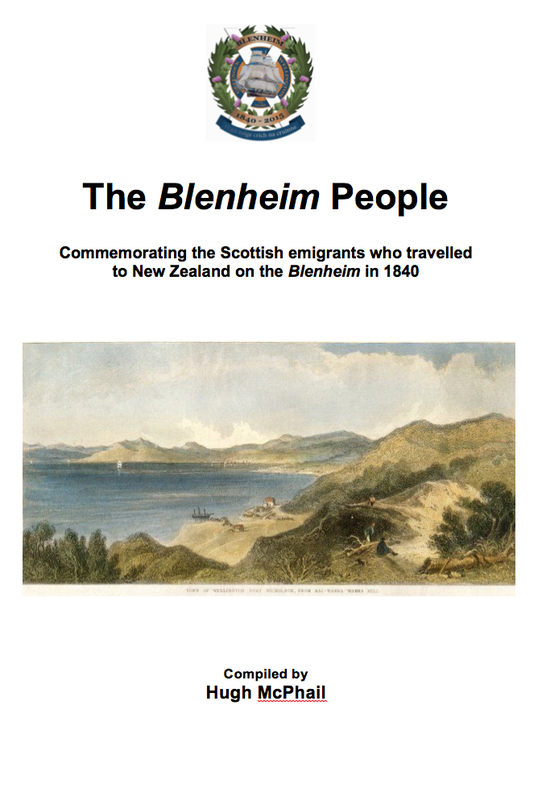 A PDF version of the book is available for download at The Blenheim People 2015, but does not include any updates or corrections that are included on this website. The text of Jessie Campbell’s journal set out here is based on a typescript held at the Alexander Turnbull Library (qMS-0370). Spelling and punctuation are as in the typescript; gaps in the typescript are marked by […], with probable typos also square-bracketed. 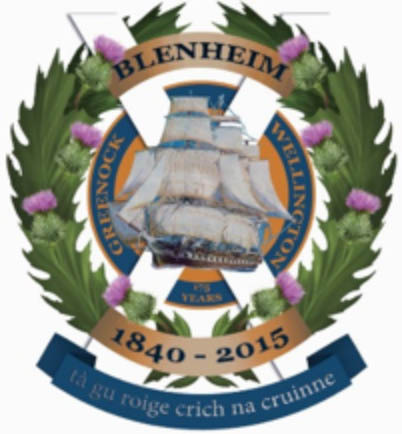 Embarked this day on board the Blenheim at Greenock, had a bad commencement to our voyage by getting drenched with rain while waiting for a steam-boat to take us alongside the ship. I was agreeably surprised at our good accommodation. Parted with my dear Ewen with the hope of meeting him next year; took neither dinner nor tea; Children and I slept in our own cabin the whole evening. J.B.S., very attentive in coming to ask if she could do anything for us, put the five children to sleep in the berth in the cabin and had a bed made for Captain Campbell and myself on the floor. Cabin in great confusion, put up with it very good humoured with the hope of being more comfortable the following night. The children very good altho they had nothing to eat but part of a loaf we brought on board with us. On first coming on board we thought we had lost a gallon of oil and tin flaggon of milk, they had been left on the steam-boat and were sent to us by the small boat which took Captains Brask, Brown and Ewen on shore. A steam-boat came at 11 o’clock at night to tow us out twenty miles, a beautiful calm night. Children slept pretty well Capt. C. and I slept wonderfully well considering the uncomfortable bed we had. Sailors astonished the children in the evening by the noise they made heaving up the anchor. Awoke this morning about six, got up about seven and assisted Mary to dress the children. Capt. C. got up and dressed before this. The twins very cross from hunger, steward told Captain C. nothing for the children’s breakfast but coffee without milk and biscuit and a little bread, he did not know how to make the stirabout and had no oatmeal, reflected on Capt. C. for not taking a small quantity of meal and molasses for the children. While feeding the two little ones with sops made of our own bread Capt. C. announced breakfast, could not go to it and feed the bairns at the same time, took a cup of coffee when the children were at their breakfast, wee bodies complaining of the hardness and toughness of the biscuit. Hold open and got the old scritoire hoisted up and put into the cabin, on enquiring for the boy’s cabin found Drimintoran had taken possession of it for his servant and youngest child and the only place left for us was small and had no door, very loud in my indignation at this and reflected on Capt. C. for being so simple as to allow it. He bore my reproaches with great calmness. Very little motion in the vessel all day, wind against us. Saw Capt. Gray at distance for the first time, very dull, suppose from parting from his wife, thought I should like to know him, sat next him at dinner, Dr. Campbell on the opposite side, J.B.S. next to me, Capt. C. next to her; got very squeamish in the evening and very low spirited. Lay on the bed, Colin and Tibbie with me and very sick, Susan on deck and quite well, John sick for half an hour, Louisa fell asleep on the floor but quite well. J.B.S. and most of her children very sick in bed. Mary Cameron fortunately continued pretty well and very active. Their maid got sick in my cabin and vomited on the floor, very angry at her and sent her to the water-closet till she was able to go to the steerage, passed another miserable night, all serene in the cabin, would not take off my clothes. Got up this morning about half past six very little refreshed, sent Mary to the steward for our allowance of water, did not get the proper quantity, told Capt. C. we must have redress. Twins very cross till they got sops. Went to breakfast for the first time, children had their breakfast immediately after ours, very vexed to see them at the hard biscuit and black coffee, rejoiced at having a private stock for the twins, Tibbie and Susan both took a good drink of the black coffee; put in good humour by Capt, C. coming to tell me that Drimintoran had given up the cabin to us and was to clear it out whenever the carpenters put a door to the other place; went up on deck with all the children. Mary gave a good cleaning out to the cabin, made it very comfortable; the weather so calm, ship laying like a log in the water, passed a good while putting my drawers in order and putting packages and portmanteaus out of the way, presided at the children’s dinner, they seemed to enjoy it very much, had very good soup and boiled beef, potatoes and biscuit, all of them quite free of sickness. Drimintoran interfering with the steward desiring him to keep the wine left, D, wished to save the stores as much as possible, he thought if there was an overplus on arriving at New Zealand it would be divided amongst the passengers. Capt. Gray very angry and threw up all charge of the mess. Capt. C., and Dr. Campbell with some difficulty pacified him by representing it proceeded entirely from Drimintoran’s ignorance. D. has not interfered in the least since. Had the carpenter after dinner putting up brass hooks for twins’ cot and small ones for hanging looking-glass and I gave him a dram of Portobello whiskey. Went all to bed at nine and twins quite happy in their cot. Awoke at the usual hour after passing a most comfortable night. Twins never awoke the whole night, Tibbie peeping out in the morning and laughing to Papa. Capt. C. always rises first to make room in the cabin. Twins breakfasted heartily upon sago and in very good humour all the morning; fine day, with a light wind in our favour. Heard that Capt. Gray intended sending a boat ashore at Holyhead, went to my cabin immediately after breakfast to write letters to my dear friends at home, wrote such a long letter to my dear sister Isabella, one each to Margaret and Mrs Gray that I was occupied until three in the afternoon; went on deck a few minutes before dinner and heard to my great disappointment from the calm weather there was no chance of our passing Holyhead till during the night; one of the steerage women fainted today from sea-sickness, her husband, by the doctor’s order laid her on her back on the dining cabin floor, she soon recovered, she had been in delicate health for some time. Capt. Gray told us at dinner he had only been a month in Britain (including the time he was coming down from London to Greenock and while at anchor there) since returning from his last voyage, he said he was not so ill off as his mate who had only been six weeks with his wife for five years. Drimintoran asked if the mate had any children which caused a great laugh. J.B.S. was much shocked at her husband’s question; dined at the usual hour between 3 and 4 and drank tea at seven, went to my cabin after the children had tea to assist Mary in putting them to bed. Skye woman of no use, always sick. Swinging of the cot sets the twins asleep immediately after they are put into it. Capt. C. lighted a taper in the lamp to burn all night in case of either of the wee bodies wakening and working their way out of the cot. Fine weather, light breeze, but unfavourable. Cause of thankfulness that we are all in such good health. J.B.S. very often squeamish and laying in bed, some of her children very sick and Catherine in bed constantly when off the Bay of Dublin. Saw a pilot boat and made signal to her; she took our letters written the day before on shore, all spoke much of the delight of our friends at their astonishment at receiving them with the Dublin post-mark. Got the proper quantity of water from the steward, viz. a pint for each; Capt. promised to give meal and treacle out for porridge to the children. Beautiful day, wind favourable. Ship going along at a good rate, got up about seven or so, long dressing, too late for breakfast, had to take it with the children. Capt. C. dressed in his long great coat wished me to make myself fine, continued to wear my Saxony, put on my black cap with roses; after breakfast John read a chapter in the bible and I read several chapters and one of Milner’s sermons, went on deck and remained for a long time. Chatted a good deal with Dr. Sutherland, he improves on acquaintance. Several vessels in sight, admired the beauty of one large ship with all sails up. Catherine much better today and sat on deck. J.B.S. busy at her devotions in her own cabin; Capt. Gray and all the gentlemen dressed better for dinner. Tibbie very unwell with a bowel complaint, took the Dr. into my cabin to see her, gave a dose of calomel and ordered her into a warm bath. Crossing the Bay of Biscay, strong breeze in our favour, vessel rolling so much everything knocking about, obliged to keep our cups in our hands at breakfast. Capt. C. spilt his coffee, Capt. Gray not pleased at dirtying his table-cloth. Quite astonished that I am neither sick nor afraid, children all kept in the cabin, but no the least sick complaint; capital pudding for the children’s dinner to which they all did great justice; steward took it for granted they were all sick and had only one duck for their dinner. […] much better today; preserved soup for our dinner today. Everyone pronounced it excellent, and a capital baked and oiled pudding; sand puddings on the table to keep the dished steady, notwithstanding which thought several times everything on the table would roll off; Capt. Gray in good humour from our getting on so quickly; observed the blueness of the water today; heard that the Capt. had given out meal for the children, sent Mary to get their allowance of water after having it boiled and putting salt into it; steward refused to give meal, very angry, got sago made for twins, big children crying from hunger so long of getting any supper found that no tea was prepared for them from the water being used. J.B.S. very violent; I said to Capt. C. knew this would be the way on board an emigrant ship; Capt. Gray spoken to and steward obliged to give out meal instantly and well lectured for his conduct. Louisa and John made a tremendous supper on the porridge and treacle. Skye woman still ill, she is so stupid and heavy she makes herself worse than she really is, wonder Mrs Mac could recommend such a person even if she is a good cook. Still in the Bay of Biscay, fine day with a light breeze in our favour. Went up on deck immediately after breakfast, spoke the Bois Arcadia from Trinidad for Liverpool who promised to report us all well. Capt. Gray and I fell on the deck from the vessel giving a sudden lurch, towards 3 o’clock fell so calm vessel making no way but rolling dreadfully, sitting at dinner compared it to dining on a swing. J.B.S. so light difficulty in keeping steady, her husband quite astonished that we was not sick and felt so comfortable on board ship. Steward much improved by the Capt. speaking to him, most attentive now to the children, giving them excellent dinners every day, good soup, boiled meat or fowls, a pudding very often, they are much pleased with the porridge and treacle. Drimintoran always takes charge of Louisa, says it is a pleasure to see her do justice to what she gets. Tibbie not very well today, neither she nor Susy have good appetites, will not take the preserved milk, but take a little of the treacle with their porridge and like sago or rice very much, very thankful I have such a good stock of both. Skye woman still laid up. A great many porpoises about the vessel, Capt. Gray speared two but they got off. Dr. Campbell complaining very much of the emigrant’s want of energy, had to put pins in them to get them out of bed, begged of him to put the Skye woman out on deck; Capt. Gray said he never saw much a hulk of a woman, if I put jacket and trousers on her she would do better for a sailor than a nurse. Go to my own cabin always to see the children put to bed, after they are snug take a while of journal. Drimintoran brings me a glass of porter every night, afraid of getting a bad habit; wonderful how soundly and comfortably I sleep every night. Found from Capt. Gray today that the New Zealand Company only gave £45 for each cabin passage instead of £60. Capt. Gray would have taken in hand the victualling himself if allowed £60; could not think of doing it for £45. 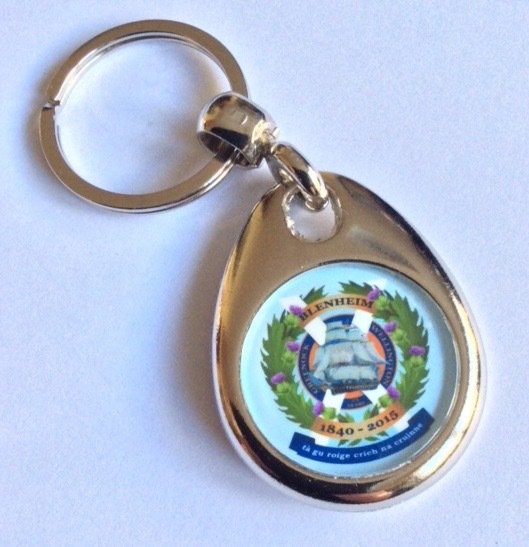 One passenger taken on board at Greenock only pays £45 for his passage, while we pay £60 to the Company, think the Directors know nothing of this swindling trick, think it is all done by the committee of management. Blowing very hard, at first not favourable, still crossing the Bay of Biscay, ship rolling and tossing a good deal. J.B.S. very sick for a short time; often thought of Ewen’s account of the Bay of Biscay, in tacking some of the rigging gave way, not frightened in the least. Gray astonished at our not being sick. Tibbie not very well yet, Susan quite well. Had the best sherry at dinner I ever tasted. While sitting at dinner part of a wave broke in upon the deck which made me nervous for a little while. I saw the Capt. and all looking so unconcerned; great lamentations among the bachelors about their beds getting wet from the sea getting in at the portholes. Dr. Sutherland says he is better than any of them. Mary Cameron so frightened at the rolling of the vessel burst into our cabin at four in the morning; during the afternoon the wind was favourable going along at a great rate. Have asked so often when we will be free of the Bay of Biscay, ashamed to ask it again. After the children were in bed wrote awhile to bring up my journal intend to carry it on regularly after this. Had my drink of porter as usual and went to bed. Passed a very uncomfortable night, vessel rolling and pitching so much could not sleep, sometimes thought when she went to the side she would not rise again. Laughed at by Capt. C. Fine day, light breeze but favourable. First thing we heard in the morning that Mrs Fraser the smith’s wife from Ardgour had been brought to bed of a fine stout boy, both doing well as possible. Capt. Gray said she much have had a rolling time of it. Child gets no other name than Blenheim. Like Capt. Gray more every day, find him so obliging, he saw that the children’s cot was not properly made, set his sailmaker to alter it all day yesterday and gave surveys himself. J.B.S. has never touched upon religion with me, but once talking of revivals and Mr. Whyte’s doctrine, of which she does not approve. One of the sailors was complained of for the 4th time to the Capt. for being lousy and eating the lice. Capt. put him in irons on the poop, the rascal struck the capt. On the face, he still wears the mark, one of the emigrants impertinently interfered and wished to rescue the sailor. Capt. Gray was going to punish the emigrant likewise until he begged his pardon and acknowledged his error. J.B.S. quite nervous at the idea of the crew being mutinous. Tibbie much better today made a good dinner on sago and all the children on deck the whole day. In the afternoon observed a vessel in sight, made her out to be a barque, thought she was going to the mediterranean from the way she steered. Capt. Gray got all the people out of bed by telling them land was in sight. My Skye woman made her appearance in wretched plight, think she is not so ill as she says, told her father I must engage another, have got Mary’s sister who was taking care of Angusina for some time with Margaret. Beautiful evening, a great change in the warmth of the climate. One of our sheep broke its leg on Wednesday last, had to be killed, had part of it at dinner today, capital mutton, everything for dinner so well dressed, our cook understands his business remarkably well. Pipers began to play in the evening. Capt. Gray set all the people to dance, he got hold of my Skye woman and forced her up, could not get her to continue dancing, he obliged an old wife to get up to our great amusement, instead of accepting of the partner [he] gave her she got hold of Capt. Gray, and forced him to dance the reel with her which he did very goodhumouredly. Children and all so happy, could not help saying how much I would give that my beloved mother and sister could get a peep at us. John a great favourite with Capt. Gray, says it does him good to shake hands with him, he has such a paw, teaching Jack, as he calls him, to climb up the ropes; John so delighted with the ship, says he would rather be here than on shore. Louisa the wonder of everybody being so well and her appetite so good. Got clear of the Bay of Biscay half past six tonight. A beautiful morning with a light favourable breeze. The barque we saw yesterday afternoon close to us, Capt. Made signals found she was the “Tam O Shanter” from Liverpool for Port Jackson with a general cargo, a smaller vessel than ours; we saw a lady on board we guessed to be the Captain’s wife; kept us company the whole day, beat her at sailing. Stayed a long time on deck, children so well and happy, Tibbie recovering her appetite and looks, had no idea I should like shipboard life so well, my constant wish is that my mother and sister could know how well off we are, often fancy what they will be saying of us; came down below and worked till dinner time making pin holes in the children’s cot to lash them better in; they had such a nice dinner today, excellent preserved soup and a mutton pie. D. took charge of Louisa as usual much amused at her appetite being so faithful, all did ample justice to their good fare. Twins took a good mess of boiled rice; we had for dinner the best pea-soup I ever tasted, two mutton pies a piece of corned beef and roasted mutton; sat for a good while after dinner all chatting together, Gray, though not a well educated man very agreeable and pleasant and [acquites] himself at the head of the table very like a gentleman. Forgot to mention there have been great many deaths among the ducks and hens. Capt. Gray says they are too crowded and has been killing a good many. Dr. Sutherland and Dr. Campbell not well today with a bowel complain, both looking miserable, joined the porridge and treacle mess to the children’s great amusement tonight. Twins quite reconciled to the treacle with their porridge. Become very calm tonight, vessel rolling very much. Tibbie very tired did not sleep all day and never off the deck. Went with Catherine to see little Blenheim and his mother, both doing wonderfully well, a fine thriving child, their accommodation better than could be expected, tho the poor mother complains very much of the heat and noise. Capt. Gray has been twice to see her and nursed Blenheim for a good while. Got the children all to bed and sat down to write my journal. John read the story of the 40 thieves tonight for a good while. We were, this afternoon in Lat. 41, longitude 12-52, two hundred miles from the nearest land which is Spain. We have two wooden swinging trays on which all the glasses and tumblers and bottles are kept during dinner. Drimintoran in taking a wine bottle off during dinner today brought it too much to the side, all the glasses and tumblers fell off on the table and broke. Admired Dr. Sutherland’s agility in saving a wine bottle. Very calm all night, vessel rolling so much Capt. C. could not sleep. Boys and Louisa in the other cabin very noisy, had to thrash Colin for striking Louisa. Mary so long of rising had to put on my dressing gown and go to put her up, all this put me out of temper. Twins always very good in the morning generally get a bit of biscuit sent them. Sat as usual on deck, washed Louisa and Susan’s heads before breakfast, made a hearty breakfast of fried pork, rice and pickled cabbage, take this every day, coffee had a bad taste. J.B.S. and I could not take it. After breakfast cut all Tibbie’s hair off by the Capt’s recommendation, gave a clipping and washing to them all, was occupied about them and putting my cabin in order till one o’clock, went up on deck with the children set Mary to clean our cabins with a scrubbing brush. Saw several vessels in sight two of them Russians. Capt. Gray never saw so many vessels as at this time. Weather very warm, a delightful breeze sprung up in our favour, delighted at it, dislike the heavy rolling of the ship when calm very much. Quite astonished that I never feel afraid and sleep so sound. Tam O Shanter not in sight today. J.B.S. very nervous at night, frightened when she hears the sailors run which they always do when doing anything about the ship, she tries to conquer this but cannot, complains of her want of faith, her husband complains she does not allow him to sleep. Children all made an excellent dinner on preserved soup and lobster, twins recovered their appetite and looking well. Capt. Gray nursed Tibbie in his arms for a good while, astonished at the luxuriance of her hair. He takes great trouble in making the emigrants come on deck and cleaning out their places below, complains of the indolence and filthy habits of the Highlanders, the few Paisley emigrants keep themselves cleaner and are more easily managed, he says Dr. Campbell is a great deal too easy with them. Had a long conversation with J.B.S. about Dr. Chriton, complained of his high charges said his accounts against F K and MacGregor were so enormous. I defended him and said his accounts must be expected to come to a large sum where he was constantly employed and so long of being settled with. Capt. Campbell considered his charges very moderate indeed. Just as we were sitting to dinner felt a bad smell from J.B.S.’s cabin, strange they will not use our convenient closet. John lost one of my tin cans for keeping water overboard while taking up salt water in it with a rope tied to it out of the cabin window, very angry with him but thankful he did not follow it, confined his for two hours to the cabin as punishment. Got sketches of married life from Catherine MacDonald and read it the whole evening, Capt, C. reflecting on me for not writing my journal instead of reading. [Lat.] this day at noon 40-16 North; Long. 13-52 W.
A beautiful morning with a fine breeze in our favour, rather late of rising, angry at Mary for being so long of coming with the water, dressed in one of gingham gowns, Capt. in his best suit very much admired, boys in drill surtouts and trousers, slippers the 3 girls in light frocks, all the gentlemen dress better on Sunday. Capt. Gray in white trousers puts on a long coat to dinner Capt. C., does the same. Soon after breakfast went on deck, cabin so warm enjoyed the fine breeze, wonder how J.B.S. can stay so much in her cabin. Capt. Gray pointed out a shoal of flying fish, saw Mother Carey’s chickens yesterday. Heard today that we had nearly got on sand banks off the Irish coast from the stupidity of the man steering, he mistook the light from Wexford lighthouse for the light of a steamboat, fortunately they sent down to ask of Capt. Gray if there should be any lighthouse in sight, he sprung out of bed and found ten minutes more would put us on a sand bank. Capt. G., said our lives might have been spared but the vessel would have been lost, glad I did not know till we were so far from land. Could not have believed I would be so comfortable on board ship. Six gallons of water stolen last night from the poop, water in consequence very scarce today, so little given out for porridge children had not enough, had to give them biscuit and gingerbread. Capt. Gray and the doctors breakfasted on porridge today. Saw one vessel today a great way off, could not make out what she was. Emigrants had prayers and a portion of the bible read to them in Gaelic, we had the same in English by a very respectable steerage passenger of the name of Sinclair from Stirling. Children had a good dinner today, preserved soup, roast duck and a delightful suet baked pudding afterwards; I can assure you they did ample justice to it. Smith’s wife and Blenheim getting on very well, she never had so good a recovery. A child very ill a few days ago, with congestion of the blood vessels of the brain. Dr. C. says he is so much better today thinks he will recover. We had for dinner today roast ducks, boiled fowls and curried fowl and pea soup and pickled pork, this is the first day we have been without beautiful cabbage for dinner since leaving Greenock, the potatoes are still very good, our having such a good cook adds much to our comfort; all the steerage passengers got flour, suet and raisins served out to them yesterday to make puddings for their dinners today, most of them did not know how to use the ingredients, they eat the raisins their children going about with them in handfuls, made scones of the flour. I do not know what they did with the suet, they likewise got pickled cabbage, a good many cannot be prevailed on to eat it and were caught throwing it overboard. John an immense favourite of Capt. Gray heard him complain of thirst tonight, sent for him to his own cabin and gave him a drink of raspberry vinegar and water. My Skye maid made her appearance on deck today in better health. J.B.S. dressed in an old black silk today and a cap trimmed with pink ribbon. Catherine in an ugly dark check, her boys in [m…..] D. in light trousers and a blue jacket. Sat a long time on deck and thought how little you would think of a voyage if it was so pleasant as we have had it yet. Lat. at noon this day 38-21 N. Long. 15-17 W.
A fine morning with a delightful steady breeze in our favour, weather very warm indeed, much afraid the heat will be very oppressive by and by, we feel it so much already. After breakfast got the cabin cleaned out, sent the two little bodies on deck. Catherine took the other children into my cabin to give them their lessons. Colin took one of his obstinate fits for which he got well whipped. Catherine had Susan at the window and allowed her to throw the lid of the tin pan overboard in which we keep the fresh water, very vexed about it, blamed Mary’s sister for not hanging up the pan where she got it. Mary defended her sister very impertinently, told her to hold her tongue I did not want to hear her opinion about it, Mary continued to answer very impertinently, said a letter would reach Dr. Macleod yet to tell how she was used, told her instantly to walk out of my cabin that Dr. Macleod forgot his duty when he did not teach her the respect due to a Mistress, that I would oblige her to make out the time she was engaged with me after that she might go about her business. Had preserved soup, roast ducks and fowls for dinner. Capt. said if the breeze continued we would be in the latitude of [Madiera] tomorrow, did not think we would see land. Lat. at noon 36-5 N. Long. 16-46 W.
Fine breeze, vessel continuing, think we have got into the trade winds. Colin not very well today, complaining of headache and vomiting, put him to bed, got a dose from the doctor, his skin hot and pulse quick. A Grampus seen close to the ship and a shoal of flying fish. Skye maid recovered and in attendance today. Could not go on deck attending Colin. Told J.B.S. if the weather continued as it was at present did not care if I was on board six months. Was horror-struck to hear that a man was ill on board with what the doctor thought was small-pox, he has been 3 weeks on board the ship, all astonished that the infection would remain so long about him before showing itself, only complained of being ill Saturday last, the rash came out today, he has been put into hospital and quite separated from all the others. It is fearful prospect a disease of this kind breaking out in such a crowded ship and when just coming into the hot latitude. May the Almighty protect us all. Capt. Gray in great dismay at this, neither he or a young boy his brother have had small pox, would rather lose his own child than anything happen to his brother, it would kill his mother, came to sea at this time against her wish. I trust in God it may yet turn out not to be small pox. Colin rather better tonight. Susy’s stomach rather out of order, vomiting a little purged. John eat so much pudding at dinner could take no supper. Tibbie and Louise in perfect health. J.B.S. complaining that John being such a favourite with the Capt. he tyrannises over the older children, never said pro or con. I am sitting at the scritoire writing this with my clothes off down to my waist and the cabin windows open; passed [Madiera] today, did not see land, ship going very fast and not so much motion as you would expect; have just drunk off my tumbler of porter and am going to bed. Lat. at noon 33-41 N, Long. 18-4 W. Made sops of rusks for the children’s dinner today and meal, the twins delighted with it, intend to keep a cup of tea for them from my own breakfast and tea water is so bad and scarce. A beautiful breeze blowing, weather very warm. Children all very good, Colin much better, discovered that Tibbie had cut a back tooth and another nearly through; went on deck after breakfast and sat a long time because so listless from thirst and heat could neither work nor read, took a drink of porter in the afternoon which gave me a headache and made me feel very unwell. Capt. C., on deck the whole day reading, angry at him for not giving himself more trouble about the children, got much better after dinner, a delightful cool breeze coming in my cabin windows which induced J.B.S. to sit till tea time with me, she makes herself very pleasant poor body. Capt. Gray looked so cool today in a complete white suit. A sheep killed last night part of which we had for dinner and very good it was, kidneys quite covered. A ship in sight at a great distance, the man who is ill is pronounced a decided case of small-pox but very favourable, I trust it may not spread the vessel has been sprinkled with Chloride of Lime. Expect to be off Teneriffe early tomorrow morning, Capt. talks of sending ashore for vegetables and refreshments. Tibbie such a favourite with all the gentlemen. Capt. G would not allow her to go to bed until he had nursed for a while. Poor cook is scarcely looked at. 1st and 2nd mates had a dreadful quarrel tonight, Capt. Gray was called out to pacify them. Lat. at noon 30-53 N Long 19 W.
Not much wind today but very hot, an awning put up on the poop which makes the deck delightful, sat a long time under it, children playing about. Saw a large shoal of flying fish. Colin very unwell during the night, quick pulse and skin hot, complaining of headache, in a great fright that it may turn out small-pox, he is much better today and able to come on deck. Dr. says he is bilious. Discovered today that Tibbie has been cutting 4 back teeth since coming on board. I think her bowels being so loose has prevented her suffering so much as she did in PortoBello, she is as lively as ever and very little reduced, she is a great favourite with our gentlemen passengers. Capt. Gray never passes by her without stopping to speak to her, he often nurses her, she claps his face a kisses him which delights him. Got sago made for Colin about 10 o’clock, put a little wine in it which he relished very much. Capt. Gray very busy today from his mates being under arrest, he blames the 1st Mate most, he struck the 2nd Mate and followed him from side to side of the deck striking him altho he knew he dare not return the blows if he had he would have been put in irons, it seems to require all Capt. Grays firmness to keep his crew in order, what a blessing to us he is so determined, he did not go to bed last night. Mary Cameron has been very submissive since we had the quarrel. Nothing like keeping her in good order. Colin is much better this evening his appetite has returned. I am so frightened for the small-pox that I got Dr. Campbell to vaccinate my arm today, he was not half the time that Chrichton used to be. We have much merry-making on the deck this evening, the Capt. set a party to dance to the sound of the bagpipes, on the other side a party played at leap-frog. My husband, Drimintoran and Mr Macfarlane were the only males that did not join in either pastime. Capt. Gray was a most active hand at leap-frog, I enjoyed looking at the fun from the poop exceedingly. It is a glorious evening, bright moonlight, a soft balmy breeze, it requires a more eloquent pen than mine to describe such an evening, the ship looks so majestic with all her sails set. Capt. 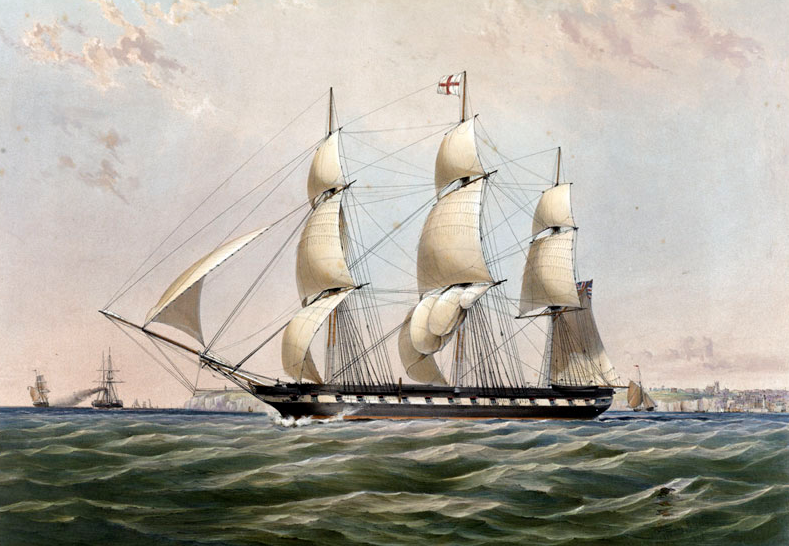 Gray complains woefully of the indolence of the emigrants, he has such a work every day hunting them out of their beds and keeping them on deck, particularly towards evening that their berths may cool before they go down to sleep. A fine morning with rather less wind than we could wish. Capt. C. as usual got up first and went for our washing water, he got better measure than Mary gets if English pints is our allowance viz. a pint for each, we are obliged to be very careful of it as this is all we get during the day except a little drink when we ask it from the steward; any water we require for sago etc; I must take from our washing allowance. After I was dressed got the twins porridge, make and fed one of them, they take the treacle very well, and will not taste the preserved milk, I tried every plan to get them to take it in vain when they taste it they put on such a face and both call out “dirty meal”. The milk has a peculiar sickly taste which I must say is not very pleasant. When I went in to breakfast found the Capt. all of sorts, in the first place his watch had stopped from violent exercise he had taken at leap–frog, two of the sheep were found in a dying state, one of them was so well bled that the mutton is very good, the other was not so well killed and was given to the emigrants, it was very fat likewise the Captains vexation was the cook spoiling two dishes of rice for breakfast one after the other, we had mutton chops for breakfast, I took my old fare of salt pork, rice and red pickled cabbage with it, I finish off with some of the hard biscuit and a cup of coffee. J.B.S. complains of the biscuit, she cannot eat rice. Went up on deck after breakfast, sat a long time. Capt. Gray joined us, gave us the history of one of his sailors, a handsome lad called John Miller, his father is the Capt. of a Revenue Cutter, he has six sisters, the eldest of them was married after a few days courtship to a sick man the Capt. of a Merchant Man, after she had one child she became notorious character her husband divorced her, her conduct had been the ruin of the rest of the family. Colin quite well. The spots on the small-pox man beginning to dry up Dr says there is no fear of him now. Children made a hearty dinner on boiled mutton and broth. We still have potatoes. I am astonished how long they have kept. I give a small bit of butcher meat to the twins which they enjoy very much; we had the best pancakes at our dinner I ever tasted they were of course, made without eggs. The twins at 4 o’çlock took a good mess of boiled whole rice and sugar. We had the dancing and leap-frog tonight and the same beautiful, cloudless moonlight. Lat. at noon 26-15 N, Long 10-38 W. One of the sailors quite drunk this afternoon, he would not confess where he got the spirits, the emigrants are suspected of giving it to him, he is to remain in the poop night and day and to be fed on bread and water until he confesses from whom he got the spirits. Little Blenheim and his mother were on deck today. A fine morning with a very light breeze. I have great cause of gratitude to the Almighty that the children are in perfect health they are quite reconciled to the treacle with their porridge, they get some of little John’s bread about 12 o’clock and we never open the box without thinking and speaking of Grandmamma. The sheep have all been clipped today, instead of pouring water down their throats from a bottle Drimintoran prevailed on them to try if the sheep would take it off their own accord, the poor brutes drank it all greedily with the exception of two. I hope they will now thrive better. The sailor is still obdurate and will not confess from whom he got the spirits. Saw a suspicious looking vessel close to us counterpart of the Midge. Capt. Gray said if he had only is own crew on board he would be rather uneasy from the direction she took, suppose she is bound for the West Indies. Capt. Gray baths every morning at least has pails of salt water thrown over him on deck. Today he put John up and threw 2 pails of water over him. John stood it manfully forsooth he would not go without trousers. One of the flying fish fell on board, had no idea it was so small. Capt. Gray and the doctor complaining woefully of the filth of the Highland emigrants, they say they could not have believed it possible for human beings to be so dirty in their habits, only fancy their using the dishes they have for their food for certain other purposes at night, the Dr. seems much afraid of fever breaking out among them, this would be a judgment on us, poor as I am no consideration on earth would tempt me to trust my little family in a ship with Highland emigrants if still had the voyage before me. Lat. at noon 24-34 N. Long 20 W. Gave 3 old cotton stockings for coolers for the wine bottles. Capt. Gray has got the loan of John’s watch, Capt. G presented him with the remaining bottle of Portobello whisky. Wine pronounced much improved by the stockings. A strong breeze, sun very bright, thermometer up at 78, ship going greater part of the day 8 knots an hour. Another death reported among the sheep, one of those that would only drink out of the bottles a great loss so many dying. Sat on deck a good while after breakfast. J.B.S joined us, very pleasant under the awning, came down to hear prayers and a portion of scripture read by the man who read last Sunday. The emigrants had the same in Gaelic afterwards heard John read, say his question and hymn. During dinner felt the heat very much. J.B.S. and I find it a great relief adjourning to my cabin, it is so cool from so much air coming in at the window. Sailor confessed at last he got the whisky from the emigrants. 1st mate allowed to do duty for the first time yesterday. Young Macdonald scratched Louisa’s face, she came to tell me she had knocked him down, everyone astonished at her size and enjoying good health since coming on board. Lat. 22-22 N. Long. 21-14 W.
Very very warm, twins nothing on but a slip and a blue striped pinafore, Louisa the same. John had 4 pails of salt water thrown over him by the Capt. this morning. A strong breeze last night, ship rolling a great deal. While at breakfast word came of a ship in sight, from her colours found she was a Spanish one. While the gentlemen were at their grog this forenoon Mr Macfarlane treated them to ginger-bread. Capt. Gray kept this and gave it to Tibbie, then he sat watching her till she eat it up, poor Susy looking on without getting a bit. Capt. Gray has just called that the ship seen in the morning has come alongside, she is an Austrian of [Triese] from Marseilles bound for Rio de Janeiro name Prince Rohares. Young men prevailed on Capt. Gray to send a boat to her to get cigars or wine. Capt. Gray prepared himself for going board of her, the tackling of the boat as they were lowering it at one end gave way, fortunately the boat was touching the water at this time, if the rope had given way sooner the Capt. and his crew would have been thrown into the sea. On their return from the Prince Rohares as they were hoisting the boat up with one man in her the rope at the other end gave way so she hung with her stern up, the sailor saved himself by catching hold of a rope. J.B.S. and I got a dreadful fright, we thought some of the men were in the boat when she fell. Capt. got 17 large melons, 3 dozen cigars and a bottle of delicious wine all of which fell out of the boat. Capt. Gray immediately lowered the boat again and went to recover his oars and melons. He picked up six of the melons after rowing a good way from the ship, the wine and the cigars were irrevocably gone, it was frightful to us to see such a little speck as the boat out on the ocean high was, we were above it we could not see it even when it went down between the waves. We had one of the melons for dessert, it was very cool and refreshing. John eat such a quantity he got sick this evening even the two little ones enjoyed it; felt so oppressed with the heat this forenoon that I sat a long time without my stays on. Had dancing to the pipes as usual tonight. I enjoy the deck very much after the sun sets it becomes so cool. J.B.S. and I produced our marmalade this evening at tea, it was very much enjoyed. All felt the heat very much during the night, this morning got a large tub filled with salt water and bathed the children. John as usual had buckets of salt water poured over him. Capt.C has commenced having a bath in the same way. When Capt. Gray observed Tibbie in the tub he went himself to bathe her. Capt. Campbell dressed today in his french shirt, it is very much admired as a suitable dress. Capt. G says he will provide himself with a good many next voyage. Louisa is today in a blue frock with only her chemises on under, not even her stays, twins in blue striped frocks and their chemises. Last night it became so calm we were terrified the trades were going to fail us, already to our great joy today a breeze has sprung up, it defies me to do any work, the heat makes me so languid. I have got the Water Witch from John Galgarry, even with the reading I get slowly on, I would be so thankful if I could go without my stays or shoes. Two vessels in sight today, one of them our friend the Austrian polacca, the other we are making signals to. Capt. Gray never saw so many vessels as at this time. J.B.S. and I are put into a great state of excitement tonight. I will tell you how Drimintorian complained to Capt. Gray that the emigrants were not getting their proper quantity of water, that he must insist on the proper measure being given them. Capt. Gray said as he was so sharp he would be equally sharp with him, he brought up his instructions and showed him that tho he was allowing the full quantity of water for every child in the cabin they were only entitled to a quart and half a day, that is under 14 years of age, so that the ten children under that age in the cabin were only to have the allowance of four grown people among them. You may imagine my distress at this, they had little enough before, I did not see how it was possible for them to do with so small a quantity in such hot weather. I gave orders to the steward instead of making coffee in the morning or tea in the evening for me that I would prefer getting the water instead that I might give it to the children, that Capt. C was entitled to 2 cups and I would get one of them. I told Capt. Gray it was much against my wish going in a emigrant ship and I saw I would have cause to repent it, he said he hoped not, I then went to consult the Doctor, he said his orders and Capt. Gray’s agreed in saying a quart and a half was all the children were allowed, which he thought was too little but could not help it. Capt. C advised me to keep quiet for that he was certain Capt. Gray did not mean to enforce this regulation further than to show Drimintorian what he had the power of doing, so I just went to my cabin and cried very bitterly and reflected on my husband for allowing himself to be cheated by that villainous company. I do not blame the Capt. in the least he has nothing to do with it further than to follow the instructions given him. You would scarcely believe how much I enjoy my drink of porter which is regularly brought to me by Drimintorian. Notwithstanding the scrapes he gets into I must say both he and his wife are more obliging and attentive. I repay her by giving her free entrance into my cabin during the forenoon, her own cabin has so little air coming in it becomes like an oven. The twins are never off the deck except at meal times and when asleep, they are kept under the awning and run about a great deal; have I not got cause to be thankful that the five are in excellent health and looking so well. Tibbie astonishes me getting 4 back teeth without seeming to suffer in the least further than her bowels continuing loose, you would laugh at me if I told you what a work is made about her by all the gentlemen and Susy taken no notice of. Drimintoran’s youngest had his face and body all broken out in large blotches from tubbing with the exception of Catherine Adam and Tommy they are all vulgar, stupid-looking children. Lat. 18-34, Long. 23-29 One sheep dead and one sickly this morning. A delightful strong breeze sending us on 9 knots an hour. Found to our great delight the usual quantity of water was given out this morning and my coffee prepared as usual at breakfast, Capt. C. reflecting on me for the I misery caused myself unnecessarily last night. Two vessels in sight all day one of them is still the Austrian polacca, we spoke of the other, she is the vesper Brig from Liverpool for Port Philip with 150 emigrants on board, we found she was the same brig we passed in the Channel on the 29th August, she is smaller than us. Capt. Campbell very bilious today, felt so unwell could not join us at dinner, has taken a dose of Calomel tonight and to take salts in the morning. John and Alistair Macdonald have been repeatedly found fault with for tying a long string to a piece of wood and drawing it in the sea over the stern of the ship, tonight they commenced it again. Capt. Gray found fault with John he deigned having anything to do with it; for telling a falsehood Capt. G has forbid him to come to the poop for 4 days. John feels his disgrace deeply. The sickly sheep dead today. J.B.S. busy making a breach shirt for Tommy, my work has been making pillow cases. Lat. 16-51 N. Long. 15-38 W.
Heat most oppressive, the exertion of dressing myself put me in a profuse perspiration. The instant the children are dressed always send them on deck till porridge, they are all in excellent health. Tibbie in such high spirits, Susy begins to make advances to Capt. Gray, he attended the bathing of both in the tub this morning and sent them in with a huge piece of ginger bread. The trade winds have failed us today, this is earlier than usual, we are now in what they call the variable wind so much against us that the ship cannot keep her course, she is pitching so much we have great difficulty in keeping our feet, everything falling about in beautiful confusion. J.B.S. and Catherine so sea-sick could not come to breakfast. Capt. Gray and two Drs not very well. Capt. C not quite recovered from yesterday’s fit of bile, John sick today and Colin not very well, very much astonished at myself for eating my breakfast as usual. Occasional showers of rain which makes the deck very disagreeable. Two vessels in sight one is the vesper we spoke last night, the other Capt. Gray is almost sure is the Tam o Shanter again. The Blenheim is likely to beat them both. So languid from heat quite unable for the slightest exertion. Capt. C never off the poop reading. Vessel pitching so much children not allowed to go to the poop. A very red sky this evening. J.B.S. and I took it into our wise heads it predicted a storm, a good deal alarmed asking everyone their opinion of the sight, all said it looked squally they would not mind that if the wind was favourable. Another sheep dead today and six hens, a great loss this to us. Notwithstanding my fears of last night slept comfortably; squalls of wind and rain this morning. Spoke a French vessel homeward bound, could not make them hear us, Capt. thinks most of them were asleep, they had scarcely any sail up although the wind was as favourable for them as it could blow. Capt. G harpooned a porpoise and some of the emigrants thought it very good eating. It cleared up in the afternoon, a good many dolphins about the ship. Capt. G harpooned one of them but it got off. Very calm and heat very great; as only my face and head perspire, suffer very much from it, my hands and feet have such a burning dry feel. This morning while dressing Capt. C observed a shark under the stern of the vessel, he gave warning, I sat in my cabin window in my night-gown and saw it swallow the bait and noose put about it and hoisted up; it was grand sport for the children. The children are getting a good deal tanned with the sun. Louisa takes a seam occasionally at the pocket handkerchief. Heard after breakfast that a ship in sight, supposed to be homeward bound. After writing a long letter (which from the heat was no small undertaking) found out that the ship was going the same course as ourselves. This is John’s birthday, kept it by giving the children after dinner a glass of ginger wine and a piece of ginger bread. Capt. Gray came down to drink his health. Children have never tasted salt meat at dinner with the exception of a bit of pork to eat with fowl occasionally. Another sailor found tipsy tonight, the Capt. in a great rage about it, obliged the emigrants to throw all their brandy overboard, all of them in a state of excitement. Very little wind, vessel scarcely moving, very great heat. Had prayers as usual. John read, said his questions and hymn, read a story to him afterwards. Mutton so much tainted at dinner could not eat it, made up for it on pudding. A great deal of sheet lightening, very beautiful, this evening. Two ships in sight all day, one of them came close, would not answer our signals. Such a violent squall came on about 11 o’clock, one of the largest sails was rent from top to bottom; although the night was very dark it was replaced in half an hour. The Smith’s infant who was very ill considered out of danger, no apprehension of small-pox spreading, the man who has been ill with it still confined to hospital. Fine morning,all well. Dispute between our servants and the steward about the quantity of water for the children, said he had orders from the Capt. to give them the reduced quantity, told him that the jug he had for measuring the water was not the proper size, on getting the proper pint measure from the hold found that even on the reduced quantity we get as much water as formerly. This caused an unpleasant feeling between Capt. C and Capt. Gray, the latter in very bad humour but continues to be very polite to Mrs Macdonald and company. He is short tempered forgets it soon but does not like to acknowledge he is wrong. Rather a stormy morning the ship not quite on her course, very hot, all well 12 o’clock cleared up the wind a little more favourable. Capt.C and Capt. Gray good friends again. Capt. C reasoned with him, shewed him where he was wrong, this is the best way of treating hot tempered men. Capt. Brown must have been aware of Capt. Gray’s temper as he begged of Capt. Campbell as an old acquaintance to use his influence to keep amity and peace on board. Capt. C told Capt. Gray this, he acknowledged Capt. C told Capt. Gray this, he acknowledged Capt. Brown was aware of his quick temper. It has been a rather stormy night but all well. Wind still unfavourable but the ship always making some way. 12 o’clock a schooner near us going the same course. 2 o’clock she is up to us and spoke to us, she proves to be the Naiad from London bound to South Australia, out 30 days appeared to be only about 120 tons. 8 o’clock retiring in good spirits after a good deal of Gaelic singing and dancing among the emigrants. A fine morning, all well, a little progress last night, all occupied this day on getting up the luggage on deck and getting a fresh supply of clothes. Twins birthday, drank their health after dinner. A beautiful day, making very little progress. A great threatening of toothache, creosote has lost its effect. Wind changed at 6 o’clock in our favour, there is yet but little of it. Very ill all night with toothache, got Dr. Campbell as he had no leeches to scarify my gum, did not give me the relief I expected, in the evening took a good dose of medicine and put laudanum in the tooth. All well, a good deal of wind and favourable all night. 12 o’clock incessant rain since 8 o’clock, all the emigrants below except some that are collecting rain water for washing. The Dr. and Capt. insist on the emigrants keeping below, getting wet in the tropical rain being very bad for them. Awoke this morning quite free of toothache. Saved a large tub full of rain water intend to have a washing on Monday, washed all the children’s heads. The Tam O Shanter abreast of us 8 o’clock, ship on her course and a good breeze. All well, the wind changed ahead through the night and is now right ahead. The ship has made little progress for the last five days. Public worship as usual. The schooner Naiad close by us, 8 o’clock wind still ahead. John said his questions etc. as usual. Fine morning, all well; head wind, supposed to be losing rather than gaining on account of the strong currents against us, the weather unusually cool to be so near the line. All well, beautiful morning, wind changed favourably. Never saw the children look better, the twins so lively and healthy. Susan is much stouter and Tibbie tho not stout has such a nice healthy colour, everyone remarks the change on Colin he is much stouter has more colour and a most faithful appetite, the warm climate seems to agree with them all. We have very nice hot rolls every morning for breakfast and the children get the same for their tea, for supper they enjoy them very much. All well, head wind. A niece of my Skye maid very ill, threatened with water in the head, she was sickly when she came on board, she is about  years old. Forgot to say got a good many things things washed on Monday, today one of my domestics is ironing them. A long time on deck with the children. All well, beautiful morning, wind ahead. Macquarries’s child rather better. Colin’s straw hat thrown overboard by Alistair Macdonald, very angry about it, gave him the one I brought in Greenock, the Macdonalds very much spoiled by both father and mother. Capt. Gray and J.B.S. have some hot arguments, she shews a great deal of temper occasionally. I sit between them and never let on I hear them, she says very rude things sometimes. Beautiful morning, wind ahead. My little darling Tibbie is very unwell today, she has a bowel complaint, is very feverish, scarcely raised her head all day, her gums are inflamed, her eye teeth must be the cause of her illness, the Dr. has ordered a warm bath for her and a dose of Calomel in the morning with Senna leaves to work it off. Fine morning, wind ahead. Poor little Tibbie still very unwell, medicine operated well, Capt. C very anxious about her, I saw her so ill at Portobello that I hope for the best, her appetite is quite gone, got arrowroot from the Dr. made it thin for a drink; 6 o’clock Tibbie is lighter this evening, she is playing with my work-box. The Macquarrie child better. Fine morning, ship keeping her course better. Tibbie still far from well but rather better. Dr. scarified her gums, I hope this may relieve, the fever has left her almost entirely but she is very weak and reduced, she took a little sago and arrowroot today, she sleeps very well at night, seems to have no pain, a little of the bowel complaint still continues but not so much as to account for her being so weakened and reduced, her hair cut as close as possible, does not vomit. Fine Morning. Tibbie rather better, Dr. hopes she has got the worst over. Capt. Gray takes such an interest in her, got the cook to make a sweet cake for her and told the Dr. and her father anything in the ship was at her service; she gets a little wine in her sago or arrowroot, she takes but little at a time and takes it often. The ship made considerable progress since yesterday. Capt. Gray expects to cross the line tomorrow. The Macquarrie child has just expired, her complaint general debility and latterly water in the head. Tibbie still continuing better, I trust she may continue. The body of the Macquarrie child committed to the deep, Capt. Gray read prayers over it. Crossed the line at 2 o’clock. Passed the schooner Naiad which we had not seen for several days. Ship going at a good rate. Discovered a baker from Paisley stealing soap in the hold, he is confined to the poop. Ship made good progress last night. My little darling not quite so well today. I begin to feel very anxious, her father is very desponding, God grant his fears not be realised, she has no pain but continues very weak and reduced, her appetite gone again. Dr Campbell unremitting in his attention to her, a great comfort she has everything she could have on shore except milk which she would not be allowed to take in her present state. Fine morning, ship making great progress. Tibbie much the same. John and Louisa not well, took no breakfast, suspect John has put his stomach wrong by going down to the hold with Capt. Gray’s brother (who has charge of everything out of the provisions) and eating a quantity of raisins and sugar. Louisa was found in the steerage yesterday and confessed she had been eating raisins and flour scones there; a [doze] of medicine will put both to rights. Lat. 4-55 S. Long. 27-14 W.
Long 28-58 Lat. 6-38 S. Fine morning, John and Louisa quite well. My little darling worse, Dr. dreads conjestion of the brain. At 12 o’clock directly under the sun. Poor little Tibbie’s head shaven and blistered tonight. Fine morning, ship made great progress. Isabella slept well, the blister did not seem to pain her, I understand it never does in a warm climate, it rose very well. Dr. thinks her much better, her eye has quite its natural look which it had not yesterday, she is livelier than she has been for some days, took some chicken soup for her dinner and chewed the bone of a fowl. Capt. Gray nursed her for a long time, she allowed him to look into her mouth when he discovered she had cut a tooth, she has very little fever and her pulse is generally from 86 to 96. No chance of calling at Rio Janeiro. Lat. 9-1 S. Long. 30-36. Fine morning, ship continues to make good progress. My little pet continues rather better but dreadfully reduced and very weak; she took chicken soup and picked a small bone, Dr. says her illness proceeds entirely from cutting her eye teeth that on shore she would perhaps suffer more, the climate here is so much in her favour. Lat. 11-50 S. Long. 31-43 W.
Dear little Isabella much worse, I can see the Dr. has little hope of her. I never despaired of her until today. I trust I may be strengthened to bear this severe trial which I fear awaits me. Capt. Gray came into my cabin to see her; ill and weak as my little darling was she stretched out her hands to him, her nursed her for a long time, she has a little bowel complaint, what she passes very green and bilious. Fine morning, strong breeze. Spoke a Brig from Rio Janeiro to Trieste. Capt. Gray boarded her and we all wrote letters he refused to take them as he would be obliged to ride quarantine 14 days if he carried them. No observation. Isabella still the same, continues free from pain, sleeps a great deal, the pupil of her eye contracts so naturally Dr. does not think her head affected, her evacuations not frequent but very green and bilious, think her digestive organs so weakened they do not digest her food, her appetite quite gone but drinks a great deal, takes arrowroot for a drink as thick as she can […] (beautiful morning) drinks it with a very little white wine in it, pulse about 90, skin quite cool. A son of Frazer the smiths ill of the jaundice. Lat. 16-39 S. Long. 32-9 W.
Isabella much the same, her pulse rather stronger, still continues to drink the arrowroot; her father deeply distressed, gentleman very considerate in keeping the deck quiet above our cabin, Dr. prevented the piper playing in the evening. Capt. Gray told the Dr. that in the case of my little darling recovering he would keep 8 or 9 fowls for her own use. I never can forget his consideration and kindness, she was such a dear engaging pet, she was a pet of everyone’s, when thirsty her cry is a “drink of water” Mrs Macdonald is most attentive comes in even at night to see how she is Capt. C. has gone to sleep in the boys’ cabin and Tibbie sleeps with me, with one of the servants night about on a mattress beside us, it is now McMillan; tapers are of use by keeping the drink in a tin for five minutes over the lamp makes it quite warm. Smith’s son better. A woman delivered of a daughter today, both doing well. The man that had the small-pox allowed to come on deck for the first time, his bedding thrown overboard and his clothes towed after the ship for several days. Lat. 18-44 S. Long 32-5 W.
Isabella rather better, her pulse a little stronger, still very little hope of her recovery, still drinking a good deal, gets thin chicken soup occasionally; for a change she did not sleep well last night but did not seem to have any pain. Dear little lamb she likes to much have me beside her in bed, even during the day she gives me her little hand to hold or sometimes puts it across my neck; she does not vomit, altho she does not eat she takes a good deal of nourishment in drinks, nothing seems to put her bowels to right, she still passes very green stuff but has no stool oftener than twice in the 24 hours. Beautiful morning, ship going at a great rate at 12 o’clock. Lat.20-8 no observation for Long. A cry of land turns out to be Trinidada, an uninhabitated island in Lat. 20-20 S. Long. 29 W. seen at the very time Capt. Gray expected which is very gratifying as it shews how very correct he is in his calculations. It seems to bea complete mass of broken rocks, puts me in mind of a large fortification. Isabella seems very uneasy and cross today, she wanted out to the cuy she was quieter there for awhile, towards evening she became easier, still I cannot say she is any better, she will not suffer anyone to look at her gums but often works with her mouth as if she has pain in them. The schooner Naiad abreast of us today again. Beautiful day. Lat. 21-46 Long. 27-42 W.
Isabella much easier than yesterday, but I think weaker, she sleeps a good deal. She vomited while Capt. Gray was nursing her and would not leave him to get shifted; he got her clean night gown and dried and shifted her, it was curious sight to see the rough sailor handling her as well and gently as I could do. ½ past 2 o’clock spoke the Naiad. Capt. Gray wanted a particular chart from him which the Capt. had not; if she calls to the Cape is to report us. Fine day, met another schooner, but did not speak her. Lat. 22-45 S. Long. 26-6 W.
Isabella much the same, I think her rather livelier, she vomited a great quantity of green bilious stuff, Dr. ordered her a dose of calomel and senna leaves after it, her stools are still greenish. Today when I was at dinner she asked for a bone of fowl she seemed to like working at it in her mouth, if she took any of the meat off she spat it out. Since Monday I have not left her for a moment. Capt. C brings my meals from the […], do not feel at all well today, Dr insisted on my going on deck this evening. Mrs Macdonald sat with my little lamb; while I was out found myself so weak could not walk for any time. Tibbie still drinks arrowroot or rusks made as smooth as gruel; her father pounds them to powder in the mortar of the medicine chest; her pulse seldom exceeds 90 and her skin not feverish, she is more restless at night than at first. Beautiful day fair wind but little of it. We are now out of the tropics. Naiad in company. Lat. 23-26. Long. 25-1. Poor Isabella much weaker, she passed a very uncomfortable night, she vomited a good deal and the medicine operated what she passed at first was green; as usual towards morning she had one or two stools which the doctor thought much more natural; she drinks a great deal today and vomits occasionally. How often we think and speak of what you would feel if you saw your little pet so reduced and changed in appearance. I think if I had her on shore I would not be half so distressed, altho she has every comfort here she could have anywhere. A beautiful day, the little wind that is not quite so favourable. Lat. 24-15 S, Long. 23-24 W.
Isabella thought a little better but very weak; the last stool she had Dr. said was quite natural in consistence and colour. I cannot help having slight hopes of her still. 3 o’clock my little darling not so well, the vomiting has begun again, all she drinks seems to turn to bile in her stomach, she has a great thirst, I think she asks for the drink from an idea it will take away the uneasiness she feels, her pulse about 90 today but feeble, a fowl was boiled down to make jelly for her, this will shew you that nothing that is thought good for her is spared upon her. Capt. C and I think that Dr. Campbell assisted by Dr. Sutherland (with whom she was a great pet) have done everything for her that could be done, yet what would I have given that Chrichton could have seen her. Beautiful day complaining of too little wind, only came 20 miles the last 24 hours. Lat. 24-33 S. Long. 23-18 W.
My dear little lamb very weak today, she has not strength to speak, she tried to say Mamma but could only articulate “Mum Mum”, her bowels seem quite natural, the vomiting still torments her occasionally but not as much as yesterday, she is quite sensible, seems free of all pain for which I am very thankful; she cannot last long in the weak state she is in, her father feels the trial of parting with her as much as I can do, she became so very engaging. One of the emigrants knocked down by a boom falling on his head, it cut him but not severely. Fine morning fair wind and all sails set, in the evening a squall rose, caused all the sails to be taken in. Lat. 25-40 S. Long. 26-48 W.
Dear little Isabella alive and that is all; she was taken very ill last night with violent pain, we thought in her bowels. Capt. C put the Dr. up, he gave her an injection which gave her immediate relief, he said the pain was caused by flatulence, she slept soundly till near morning, her hands have a slight convulsive movement today, she is laying quite quiet seemingly in a state of torpor; twice I thought she knew me, her eyes certainly followed me, her breathing quite regular, she still swallows a teaspoonful of drink at a time. This is a very wet, cold, windy day. My dear little lamb lingered in the same state all night, she expired this morning at 8 o’clock; she resigned her breath as quietly as if she were going to sleep without the slightest struggle. What would I give to be on shore with her dear little body, the idea of committing it to the deep distresses me very much, she has made a happy change from the cares and miseries of this world, it is hard to say what misfortunes may await us from which she has escaped. The Doctors did not seem to understand what her complaint was, both agreed it had been brought about by teething and that she would have had the same on shore. She will make me a sad blank for a long time 12 o’clock […] My little darling’s body has just been committed to the deep. Capt. C tells me Capt. Gray was so much affected, he could scarcely read the funeral service; he made such a work about her, she was very fond of him, could hold his face between her little hands and kiss him. John seems to feel her death a good deal, the others did not mind it. Her father feels this sad bereavement very much. Lat. 31-25 S. Long. 19-14 W. Fine morning, wind the same as yesterday went into the cuddy for the first time for a fortnight to attend divine worship and went on deck afterwards; find myself much the better of fresh air; day so cold, put on my tartan cloak; have got a blanket put on each of the beds, put on my flannel petticoat this morning. Boys have got their old tartan surtouts on, girls have got their flannel petticoats. Susan missing her dear little sister very much, searched the bed for her, was like to break my heart hearing her calling “where’s poor Tibbie?” Wind more favourable, ship going 7 knots an hour. Attended the meals in the cuddy for the first time. Soft morning, all well. Occupied in getting up the luggage and changing the dirty for clean clothing, very glad to get my saxony gown out of the hold and worsted stockings. Weather very cold. Mary Cameron in great distress at getting a black silk gown and red merino stained by the sea; rejoicing mine being so secure. Mrs. Macdonald , who thinks herself wiser than any other body would not be convinced in Greenock of the necessity of getting a tin box for her silks, should not be surprised if she suffered for it. The needles I am using in my workbox getting rusty. Fine morning, weather getting colder, wind not quite for us but ship keeping her course. Some of the gentlemen amusing themselves shooting at birds of which we saw a number. An addition made to our number by the birth of a daughter to MacLachlan from Portobello, it is the poor woman’s first child, both doing well. Drimintoran Macfarlane (who is very stout) and Dr. Sutherland climbed up the main mast, Mr Macdonald went up near the main top, the other two did not venture nearly so far; the sailors got a hint and lashed them all fast to the mast until they agreed to pay a fine. Mrs Macdonald instead of being proud of her husband’s dexterity made such an attack on her husband at tea for making such a fool of himself that astonished the gentlemen, not that she was violent as so very sarcastic, they admired how good-naturedly he took it. Capt. Gray spoke to Capt. C afterwards of her temper, I was not there. Lat. 32-50 S. Long. 12-53 W.
Very cold morning, good breeze of wind but not quite so favourable as we could wish. A Paisley woman delivered of a daughter, the women do not seem to suffer as much as at home. Lat. 33-9 S. Long 9-59 W.
Fine this morning but quite calm, the gentlemen firing at birds etc. Capt. Gray killed an albatross with a hook and line a bird with a body about the size of a goose, between the tips of the wings it measured 9½ feet. Row between the mate and one of his sailors, the sailor put in irons. Mrs. Macdonald discharged one of her servants for insolence, she is sister to my Mary Cameron, they are a forward, pert set. My maid has been quite spoiled, she has been tolerably obedient and submissive since she and I had a row soon after coming on board; I will not keep her after her six months are out. My Skye maid has improved very much, she is so careful and interested in the children. Fine morning, all well, fair wind, ship going 8 or 9 knots an hour. The sailor in irons attempted another row but failed in it. 8 o’clock, a stern sail torn, wind becoming a gale, a good many sails taken down, always frightened at the sound the sailors make particularly when blowing hard. Susan still missing her sister, said today “poor little Tibbie [alway] to Balla”…odd how long she recollects you, she speaks a great deal and very plain, her dear little sister did the same. Gale continued all night, did not sleep, the vessel rolling and pitching so much, every light thing in the cabin rolling about; a portmanteau in which I had a bottle of ginger wine and a bottle of raspberry vinegar I got from Capt. Gray rolled about so much that the bottle broke and I lost the contents, fortunately nothing in the portmanteau suffered. While the children were at dinner all their soup plates rolled to one end of the table, they got great praise for saving the plates and their contents by their exertions. How Colin’s would have gone had I not been beside him. Mr Macdonald always presides at the young people’s dinner. 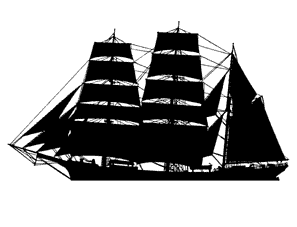 We have only three sails up and two of them reefed. 2 o’clock wind changed against us. 8 o’clock wind more favourable, still blowing very hard, ship keeping her course. Children amusing themselves wonderfully well confined to the cabin all day, altho we are still 400 miles west of the cape they call this a Cape gale; a much heavier swell in the Sth. Atlantic than north of the line. Lat. 35-44. Long. 2-25. Stormy but all well. Alarmed last night by a call for Capt. Gray who with his usual dexterity was immediately on deck; it seems a heavy squall came on which laid the ship over till they took in most of the sails; it relieved one very much to hear Capt. Gray return to his cabin whistling. A dreadful smash at breakfast all the cups and saucers and plates on one side of the table took a rapid journey to the other and several were broken and Capt. Gray nearly scalded by the quantity of hot coffee that came upon him; three of the gents followed their cups till the side of the cabin brought them up together; it was a very laughable scare particularly for me who sit so snug. Gale did not abate till evening, no public worship today, children and I passed most of the day sitting in bed telling stories on part of the Bible to the 3 big ones. Capt. C took a good sleep in the boy’s cabin. We got very little rest last night. Lat. 25-12. Long. 43 W.
Fine morning wind ahead, all well; alleged that my better half and Dr Campbell are the greatest gamblers when the wind does not answer. The prisoner has been released I am glad to say. Colin is making progress at school as the lessons are given in my cabin I always hear how they are coming on. Catherine has a very good method with young children. Louisa has commenced hemming her papa’s coloured neck-cloths, she is nearly as far with her lessons as Colin. Lat. 34-40. Little wind and not favourable, fine bright day, all say this weather is very unusual so near the Cape. Forgot to mention the first pig killed Saturday last, children had a roast of it on Sunday with which they were delighted, no one more than Susan, it was as delicate as lamb, so different from the pork on shore. The children were tiring of preserved meat which they were getting from some time. We are to have a sheep and pig killed every week, the pigs are very small; we have good soup every day and the children the same and fresh meat every day preserved beef; our potatoes are done , except a few we get when there is any fish on the table; we have a curious dish for breakfast once a week, a fish pudding, the day we have that we get no rolls. Lat. 36-6. Long. 2-29. Fine morning, all well, quite a calm. A barque in sight going the same course with us, the first we have seen for many days. Capt. Gray always at Mrs Macdonald and I to go on deck, I sometimes walk when I get the support of my husband’s arm. Nothing to remark. Lat. 36-41 Long. 3-9. Beautiful morning, all well, a calm all night. 8 a.m. light breeze not quite favourable, ship is making a little way on her course, ship we saw yesterday making for us but not so near as to speak her. You would scarcely believe how much Susan speaks of her dear little sister, always asking where she is, to me it is heart-rending to hear her. Capt. C, has brought from Capt. Gray a wooden water pail, with a lid on it of good size. Ee manage to save a little of our allowance of water every day by keeping it in the pail we have as much at the end of the week as washes a few things, so that tho I did not get my washing at Rio Janeiro we can keep ourselves quite clean, till the end of the voyage. Louisa since the cold weather began wears her dark silk with a pinafore and the nainsock Sunday. The boys in their old surtouts. Beautiful morning, light breeze for us. Mrs Macdonald and I went down to steerage and women and girls berths for the first time. Quite delighted with the cleanliness of them. Capt. Gray takes a great deal of trouble in obliging the emigrants to keep their places in order, he drives them to deck in good weather with a small cane calling “[…]” the only Gaelic word he can say. The ship in company for two days is the Isabella Stewart from London to Sydney out 35 days. The wind is now fair all sails set, we have such a great many large whales today some of them quite close to the ship; saw also the little Blenheim today in the steerage, firm, stout, thriving babies none of the mothers ever had a […]. Beautiful morning, all well, a calm. Capt. C as usual desponding at the long voyage we are likely to have. Have got Cook’s Travels from Dr Sutherland, very much interested in his account of New Zealand, as I can depend on his having written the truth. Fine morning after a wet night, the ship keeping her course and going 6 knots an hour. Walked on deck for an hour and ten minutes with Capt. C’s arm. Susan running from one end of the poop to the other humouring the motion of the vessel much better than I can. John is quite a sailor, knows the name of every rope and stick on board; the other day his father went on deck and was horror-struck to see him near the top of the main mast he was afraid to scold him till he got on deck. Fine morning, all well, and continuing to go at a great rate. Never saw such coarse, rude boys as the Macdonalds you would never suppose them to be a gentleman’s children. Catherine has been a good deal spoiled, she has been taught to consider herself very well informed from never being in any society and a difficulty she has in expressing herself from a wish to use dictionary words, she is very prosy and tiresome. Fine morning, ship going at a tremendous rate, 9 miles an hour all night rather too high a wind to my taste. Capt. Gray calls it a glorious breeze. 12 o’clock off the Cape of Good Hope farther south than 300 miles. The gentlemen form two card parties every night in the cuddy, as I have more light to read or write in my cabin I always go there at 8 o’clock. Mrs. Macdonald comes to me with a bit of biscuit and cheese and a glass of porter or ale; if I do not pick up it will not be for want of good things, I am now as strong as ever again. Mr. Macdonald never tastes spirits and instead of the brandy and water the others take at meals he divides a bottle of malt between himself, his wife and I; the water for drinking is all filtered and most excellent, I never would desire to take better, the Thames water always improves after a while, during the hot weather it was rather warm, now it is quite cold. I do not feel so comfortable tonight as it has the appearance of being rather stormy. Lat. 39-45. Long. 18-33. Rather a stormy morning but much more moderate than it was during the night. The mate put under arrest last night for insolence to the Capt. when found fault with for not taking in the mainsail during the heavy squall that nearly tore it to pieces. I was very much alarmed that something was wrong about the ship when I heard the noise on deck. Capt. C complains today that I do not allow him to sleep when it blows hard. Got a severe fall in my cabin today, fell against the scritoire and struck my hip-bone to the edge, so painful could not sleep on that side. Wonderful how the children escape. Steward taken ill today. Mr. Macfarlane absent from breakfast for the first time, made his appearance at dinner and got so ill had to leave the table; he is a great, vulgar, harmless beast of a man. The breeze moderate and continuing favourable. Lat. 39-21. Long. 22-56. Lat. 39-38. Long. 26-8. Fine morning, moderate breeze in our favour, all well except the steward who is still confined. The mate restored to his duty. Busy giving a good cleaning out to my cabin. The weather warmer than last week, was several times last week obliged to get a bottle of hot water for my feet. Capt. C walks a great deal on deck sometimes for hours at a time, he enjoys excellent health. Beautiful morning. Louisa coughed a good deal last night; a good many complaining of cold. Dr Campbell has a […] on. Ship going 8 miles an hour. Public worship as usual. Steward still confined, his complaint is erysipelas in his arm, he is getting better. 8 o’clock breeze still continuing. Heard John his questions etc. as usual and read memoirs of Mr. Vense, author of the whole duty of man, got it from J.B.S. Lat. 40-2 Long: 29-10. Fine morning. Louisa coughing much less; bathed her legs last night in hot salt water and gave her a warm drink in bed which has done her much good. The steward at his duty again. The breeze continued all night and the ship has made great progress. 11 o’clock a very large ship in sight. 2 o’clock spoke her, she is the Vernon from London to Calcutta, left 17th Sept. she has a steam engine and seemed about 1000 tons, she is a splendid looking ship, saw 8 or 9 ladies on board so gaily dressed; when they left London the Egyptian Question had created a sensation likely to end in a rupture with France; the Capt. promised to report us from Calcutta overland. All day on deck, much warmer. Lat. 40-25. Long. 33-12. Stormy morning, sea running very high, ship going at a great rate can carry very few sails. Capt. Gray still calls it a glorious breeze. Another added to our number by the birth of a daughter to a man from [Risley]. Mother and child doing well, this is the 5th birth on board all doing well. 8 o’clock the gale increasing shockingly, the Capt. anticipates a stormy night, does not intend going to bed for some time. I expect a very sleepless, uneasy night. John, on my asking him about the wind was forsooth amused at my being frightened and told me that the sailors thought nothing of this breeze. Lat. 40-23. Long. 37-29. Stormy morning. Louisa’s cough quite gone. The night was very stormy I could not sleep I was so frightened; I often thought when the vessel went to the one side she would never rise again; a great deal of vivid lightning; the children slept quite soundly, even if I were not alarmed it would be impossible to sleep the sailors made such a noise shortening sail etc. add to that the tremendous noise of the rushing of water at the stern and the noise of the wind. The ship has been going at the rate of 8 or 9 miles an hr. To my great delight the gale is lessening. 8 o’clock fine evening with a light breeze in our favour. Capt. Gray told Capt. C today that he knew all Mr Macdonald’s history, that he had failed for £10,000 and of his intemperate habits. Mr Macdonald told Capt. C that he has hopes of getting a situation from the Company as he had letters from some of the Directors to Col. Wakefield; he says it will be useless for him to go to his land as he has no subject to stock it or improve it. (Of course we are very doubtful however time will soon shew). His wife and daughter are to keep school he says in Port Nicholson. Catherine is fit to teach none but mere beginners, what her mother means to teach I cannot fancy. I forgot to mention that we nearly lost one mate last night the vessel gave such a tremendous lurch to one side he was thrown with so much force that he went completely out of her into the boat at the side, if he had fallen a little further up or lower down he must have gone overboard. Mr Macfarlane absent again today. I hear his illness is occasioned by his being quite drunk in his cabin last night; he must have got it from the steward or have a private store, yet he is a great protege of J.B.S., he pays her great deference. From this date back to the 1st of October has been written from the […] within the last week, the principal events copied from Mr Macdonald’s journal, the rest supplied by my own memory. Fine morning with a light breeze in our favour. Had such a comfortable night’s rest last night, went on deck and had a good walk, air very chill. Children all running so healthy, we have from 50 to 60 children on board under fourteen; there is a great change for the better in the appearance of most of them. Read a good deal while Wilson’s Tales of the Boarder, they are very stupid. Still mending stockings in the heel, work gets on slowly on board ship. At noon out lat. was 40-35. Long 44-34 East. Breeze freshening, ship going about 8 knots an hour, this is what I call a comfortable breeze. I forgot to mention that when a sheep is killed my Skye maid is employed to make the haggis, and very good she makes it. A wet morning with a very stormy breeze in our favour. Ship going from 8 to 9 knots an hour, so high a wind during the night that several sails had to be taken in. 10 o’clock day cleared up; just finished patching John’s surtout. Breeze rather increasing at noon, our lat. was 40-28 S. Long. 40-8 E. Had a black pudding for breakfast today and some small ones of pigs blood garnished with fried pork; a strange dish you will say, however it seemed to very much relished; one of our pigs met with a strange death yesterday it was choked in a small cask of yeast the cook had prepared for baking bread. Catherine confined to her cabin for some days from a chilblain bursting on one of her toes, she has been obliged to poultice it. The woman who was confined the other day very ill, threatened with inflammation of the womb. Capt. Gray has hopes of being in New Zealand by Christmas Day. 6 o’clock blowing a strong gale, Capt. Gray busy making the ship what he calls snug for the night. I anticipate a sleepless, night, Capt. Gray advising me if I ever came to sea again to take a cot in preference to a berth; he sleeps in one himself. Mr. Macfarlane obliged to go to bed before dinner again, his mind they say is not quite right. Dr Campbell says it is a slight attack of [delerium] tremens; a long discussion about him in the cuddy, no one spoke more of drinking than Mr. Macdonald, he has little idea his own character is so well known, we are often much amused to hear him talking with such coolness of drunkenness to hear him you would think he had never exceeded in his life. Capt. Gray told Capt. C he heard Mrs. Macdonald’s temper was the cause of her husband’s drinking. Desolation Island. Passed a very comfortable night. Wind still fair and blowing a stiff breeze, threatening rain and altogether a very cold, comfortless day; passed most of the day in my own cabin; John learnt his questions etc very well. Had public worship as usual. A very large whale seen quite close to the ship. Catherine has come to the cuddy for the first time for several days. 2 o’clock so cloudy could not take an observation; just been superintending the children at dinner and a capital one they had; pea soup capital roast pork and rice and baked plum pudding, I fear they will miss the good fare they have when they get on shore. Colin is the only one of mine that take the preserved milk with his porridge he likes it very much. Immense numbers of birds about the ship. We have today what I call a very comfortable breeze sending us on from 6 to 7 knots an hour; so cloudy could not take an observation. Miserable Macfarlane quite deranged, he took Capt. Gray to his cabin and begged of him to take charge of his land orders and some other papers as he knew they were to be stolen from him. Capt. Gray got Capt. C to put his seal upon them and made him witness the sealing of them; unfortunate wretch he is to be pitied altho he has brought it on himself, he did not come to dinner. I forgot to mention it was only last week that Little John’s biscuit and gingerbread were done. I have a few rusks still. Susan would not look at them while the ginger-bread lasted, she is now very glad to take them. You could be amused if you heard how J.B.S. wishes to shew off occasionally last night she said she was so astonished when she first came to the Highlands at the barley bread and the quantity of eatables put down to breakfast, in her country (of course England) nothing was put down but toast, butter and tea, altho they had plenty of eggs they never thought of having them for breakfast. I asked how they used them, she said puddings for dinner. I asked if she never saw a boiled egg till she came to the Highlands, she said her father and mother occasionally took one. A light breeze not quite so favourable as we could wish. Very cold, had not courage to go on deck. Capt. C has had his usual walk. Macfarlane very ill today, Dr. has taken him in hand; he awoke the Capt. out of a sound sleep very early this morning to complain to him that all the passengers were leagued against him, that John Cameron had stolen his shoes and that Dr Campbell his shirts and a great deal more nonsense. At noon we were at lat. 40-4. Long. 64-17 E.
Beautiful morning, much warmer than usual. Very little wind but favourable. Superintended a complete cleaning of my cabin, sewed Louisa’s bonnet for the 20th time, had a long walk on deck. J.B.S. and I had a hot argument, at least it was warm on her side, about Dr Johnston’s tour through the Highlands; I got Dr Campbell to join me, she said Dr Johnston was quite correct in all he said of the Highlands, we said he was not, and gave as our instance of it what he says about the want of wood; she was very ill pleased at me for saying she could not judge from her own observation as she had only seen one poor small corner of the country, she certainly improves less on intimate acquaintance than any person I ever met with, she has such a disagreeable temper, and like many weak people such an opinion of herself. Saw a shoal of about 20 small whales called the Bottle Nosed whales, some of them came close under my cabin window, they average from 12 to 15 ft in length. Macfarlane much better today. Capt. Gray is determined to keep everything in the drinking way out of his reach. Dr. Campbell told me today he thought he was athirst and that it was a great effect on on his mind, he is always worse at night and cannot bear to be in the dark. 6 o’clock breeze freshening sending us along 4 knots an hour; at sea 13 weeks today and three calendar months. So cloudy could make no observation. A fine morning with a strong breeze in our favour, sending the ship along at a great rate. We had a good breeze all night. Poor Macfarlane very ill, his head has been shaved and blistered; he has taken umbrage at me and was telling Capt. Gray the most unaccountable things of me, he says my John has been mocking him all day, this of course, is all nonsense. Luckily he stands in great awe of the Capt. I was a good while on deck, Dr. Campbell and I were discussing our New Zealand prospects. We expected to pass in sight of 2 islands called St. Paul’s and Amsterdam. If the weather permitted Capt. Gray intended to send a boat’s crew to fish; immense quantities of firm fish are got close to them. The wind we have at present has sent us to far south that they will not even see them, this is rather a disappointment. At noon we were in Lat. 40-55. Long. 70-23 E.
Blowing rather hard in our favour with a heavy swell; a very strong wind during the night, ship going at a great rate. At 3 o’clock this morning the wind changed so suddenly from one side of the vessel to the other that she was in danger of being taken aback the man at the helm was thrown completely over the wheel. Capt. Gray was on deck immediately to save his masts (it was blowing strong and a good deal of sail up) he put the the ship as quickly as possible round to the wind, until they shifted the sails. I was very much frightened at the extraordinary rolling of the vessel and the noise on deck. Mr. Macfarlane is quieter today but still far from the right, he has not made his appearance in the cuddy. I did not venture on deck the wind was so high. I was reading during the forenoon Colbourne’s Magazine extracts in it from Mrs Trollope’s amusing novel the “Widow Married”. At noon we were in Lat. 41-9. Long. 75 E. 6 o’clock glad to hear from Capt. Gray that the glass is rising; a strong favourable breeze still continuing. A fine morning. wind not so strong but favourable. Sea much smoother, ship making good progress. Got a fall in my cabin which hurt me a good deal; I had Susan on my knee, saving her made my fall worse. Sat on deck a good while, this is the clearest day we have had for some time. Wind very sharp and cold especially in the morning and evening. A capital sheep killed last night, had no idea such fat mutton could be had on board ship. Discovered today that Susan is cutting the last of her teeth, she is in perfect health but complains of a sore mouth. At noon we were in Lat. 44-3 S. Long. 70-10 E. In 16 days we have run 2,800 miles from the Cape, this will show you what strong favourable winds we have had. Macfarlane made his appearance after dinner in the cuddy, he seemed quite and more collected, his eye had a rather restless look I did not like, he came from one end of the cabin to the other and sat close to me which I did not altogether like. I forgot to mention a sensation John caused Thursday night about 9 p.m. I sent Mary to bring him to bed, as she was passing through the cuddy John came to into my cabin without being observed by her or anyone; Mary of course could not find him anywhere, she then alarmed his father, the Capt. and all the gents searched every corner of the ship, at last they were almost sure he had gone overboard and were so sure of his not being in my cabin that they would not look in as they knew it would alarm me so much. I thought they had all gone crazy on hearing the cry from one to another that John Campbell was found when he was seen coming out of my cabin to got to bed; he and I were quite unconscious of the hubbub about him. Capt. C was some time before he recovered from his fright. A gloomy morning and cold, a strong favourable breeze ship going at a great rate. Public worship s usual; put their best tartan surtouts on the boys, very smart they looked. Alexander and Campbell MacDonald have had a fight; their father would not allow them to get any dinner, this is a dreadful punishment as this is a pudding day and they dislike porridge so much, they take very little breakfast; what I consider much greater faults are often overlooked. Mr. Macfarlane continues better, he still has some symptoms I do not like, he is so restless, never sits in one place five minutes. All beginning to talk now a great deal about our arrival, our destination and discussing our future plans. Capt. C bought from Capt. Gray two larger stone butter jars for 4/-each, we have had the best salt butter I ever tasted on board. At noon we were in Lat. 41-19 S. Long. 83-29 E.
A gloomy morning, strong favourable breeze; ship rolled such a lot during the night Capt. C got no sleep; she still continues to roll very much. In my own cabin all day running children’s stockings in the heel. Astonishing how quickly the time passes, there is so much sameness. So cloudy no observation could be taken today. Capt. Gray expects a hard gale tonight, the glass has fallen very low. 6 o’clock wind has increased very much, every prospect of a stormy night, sea running very high; Capt. Gray making or rather getting things snug for the night. I feel rather nervous consulting my oracle (as I call him) John Cameron very often as to his opinion of the weather, he is such a sailor that he knows everything about a ship, he is a very nice lad and has been well educated he is very fond of children. Susan calls him Shon. Macfarlane is today as ill as ever, I fear there is no hope of his recovery. Dr. Sutherland very ill with ear-ache did not rise till dinner time. Such a night as we passed, the wind was high till 12 o’clock, when it shifted a little and blew very hard indeed. I would call it a storm if I was allowed. About daylight it modified a little. Capt. C never closed an eye from the rolling of the vessel and the noise of the sea and wind. Fright made me pass a sleepless night; a cask of empty bottles on the deck was thrown down and rolled on the deck, it made a tremendous crash. One old religious man of the emigrants said he was sure we would all go to the bottom as a judgment on the Capt. for ordering a pig to be killed on Sunday. Children slept quite soundly through it all. John does not mind blow high or low. Colin does not like a hard breeze for fear the ship ‘cosses”. [Lucy] does not suffer any inconvenience except when she finds difficulty in keeping her feet. Susan keeps her feet better than any of them, when it defies her to stand she sets herself sitting on the floor. The morning is still blowing stormy and a very heavy swell, the sun is bright. We were in Lat. 42-23, Long 91-59. Dr. Sutherland has made his appearance, he suffered all night from pain in his ear, Macfarlane is a little better today, he is restless as ever; the black handkerchief on his head gives him such a odd look. 6 o’clock every prospect of getting a good night’s rest, a quite favourable breeze blowing, the sea has gone down very much. A strong favourable breeze, it is 3 weeks today since we passed the Cape, in that time we have run 3,800 miles. Capt. Gray never had such a run except once coming round Cape Horn in winter. I must confess I would rather prefer quieter sailing even if it was a little slower; the reason given for such constant high wind is our being so far south. So much motion cannot venture on deck; children contrive to run about the low deck. 6 o’clock glad to hear the glass is tending upwards, wind moderating. 8 o’clock prospect of a sound sleep tonight. This morning Colin looking out of window announced a shoal of bottle nosed whales. Lat. 42-32. Long. 100-60. Blowing very hard with heavy showers of rain. This has really been a very stormy week. 12 o’clock blowing a gale, one of our sails torn, some of the sails taken in. Could get no observation. I am getting so accustomed to high wind that I have got very much over my fright. Not so cold from the wind having a good deal of North. Busy reading another number of Colbourne’s magazine. J.B.S. keeps entirely in her own cabin from having only one servant she is obliged to nurse a good deal: she and I are good friends but seldom meet except at meal times. She goes off to her own cabin very soon after dinner; I like to sit with the gentlemen particularly in the evening, when it blows hard it gives me the courage seeing them so unconcerned. Susan often visits Capt. Gray in his cabin, he gives her raisins; tonight she came to me in very bad humour and calling half crying “bad Capt. Gay”. She had been with him and did not get any raisins; she has a very interesting gab, I never had any at her age that spoke so much or so plainly; she still speaks occasionally of her little sister, odd how long she misses her. 5 o’clock heard a tremendous fall on deck, John immediately called out that was either Mr. Macdonald or the hen-coops. Capt. Gray came convulsed with laughter to tell us it was Mr. MacDonald, he was not hurt. lucky for Capt. G the little wife did not see him laughing at her husband. Pleasant prospect for night wind increasing, glass falling, very little sail up, the little there is reefed. Blowing hard still with a high sea, we had a harder gale last night than we have ever had yet. Capt. Gray is my authority for this, fortunately it was favourable; the emigrants were very much alarmed, the vessel shipped a good many seas, some of the water found its way down the hatchway which made people think she was sinking. They are like me easily alarmed; we are most uncomfortable today from the rolling of the vessel, I am obliged to sit in bed as the steadiest place a write this. Lat. 43-36. Long. 108-35. The last week has accustomed me so much to high wind that I was not frightened last night and even slept a good deal. Capt. C never can sleep when the vessel rolls. What an awful place this must be in winter, if you ever cross the seas you must leave Britain in August or September so as to be in the high southern latitude with summer weather; we never have had good weather for more than 2 or 3 days at a time; in winter there are often weeks of it. Macfarlane has been more composed for some days, he is still far from right. J.B.S. takes a great interest in him, she says from their being (with the exception of Capt. G) the only lowlanders. In the cabin she complained to me how little trouble the gents took to amuse him etc., now you must know he never was intimate or a favourite with any of them: was it not ridiculous? to suppose that young men would give themselves trouble about a great vulgar fellow who brought on his own complaint by intemperance. Capt. Gray takes more trouble with him than I could expect. 6 o’clock a beautiful evening, wind and sea gone down, all our reefs shaken out and more sail put up. A beautiful morning, very little wind, ship only going about a mile an hour, warmer than it has been for a long time. Our lat. 43-28. Long. 111-24 E. For the last 26 days we have run 4,531 miles of long. beside some degrees of latitude. Poor Macfarlane consulting Capt. Gray what he could advise him to do on arriving in New Zealand; thought himself his best plan would be to marry some decent well-behaved woman that would take care of him, he was afraid he could have no choice but to take on one of the emigrants, a great deal of laughing and joking about this after dinner today. Public worship as usual and heard John his questions etc. Have been wearing your mousseline de laine shawl for some time to keep me warm. Today so warm glad to put it off. A great change, so quiet at dinner without the sandbags or puddings as they are called. 5 o’clock breeze freshening, going 4 miles an hour, children all enjoying themselves so much on deck. Susan has a very sore thumb, a small splinter of wood ran into it close to the nail, it was not observed until it had festered under the nail. Dr. C cut it open today, she stood the operation wonderfully well and went immediately to tell Capt. G what had been done to her. A delightful breeze carrying us along 7 miles an hour, went up on deck and had a short walk; still working at children’s stockings they will keep me busy till we arrive at our destination. Flora Macdonald not well, confined to bed with a slight bilious attack. Macfarlane has taken a melancholy turn, never speaks and only sits in the cuddy at meals; the moment he swallowed his dinner went off to his own cabin. Sinclair who reads and prays to on Sundays knew Macfarlane before, he is constantly with Macfarlane and as the latter has been reading his Bible several times we think he has taken a religious turn. J.B.S is delighted at this I should doubt his mind being in a fit state to receive proper views of religion. 6 o’clock Susan brought into my cabin crying bitterly, complained of one of her arms and would not allow it ro be touched; on stripping her found it very much inflamed and swollen about the elbow. Mary Cameron denied firmly that Susan has got a fall or that there was any cause for it. I was alarmed until the Dr. examined it and found a blue mark which shewed she must have got a fall; he bandaged it and rubbed it with [soal] linament. Lat. 43-35 S. Long. 114-45 E.
Blowing hard, still favourable, was awoke at 4 this morning by the noise on deck in consequence of a violent squall of wind coming on so suddenly that Capt. Gray came on deck almost naked. One sail was torn completely and two very much injured. The emigrants so frightened most of themen ran on deck. J.B.S. came out of her cabin to collect the information from the steward. Capt. Grays’s cheek festering it gives him great pain, brought on by cold; he was not able to breakfast with us this morning; he is very hoarse from additional cold caught this morning. Susan’s arm quite well. 10 o’clock wind increased blowing strong gale, our lat. 43-44 S. Long. 118-55 E. 5 o’clock sitting in the cuddy looking at Mr. Macdonald and Capt. C playing drafts, all of a sudden it became very dark, we were startled by a loud peal of thunder and a vivid flash of forked lightning followed by the heaviest shower of rain I ever saw; we had none so heavy even between the tropics; after this the wind got rather lower and it cleared a fine evening. 8 o’clock wind freshing. Daylight till 8 o’clock. At 8 o’clock in the morning with you it is the afternoon with us. A strong favourable breeze. You could have laughed if you had seen me dressing this morning; I had a basin of water on the locker washing myself, another large basin of water beside me Capt. C was going to use, he was leaning against the scritoire strapping his razor, the vessel gave a tremendous roll, in attempting to save both basins I lost both and my own footing, to the bargain, basins, water and I were thrown against the side of the cabin with such force that Capt. Gray thought some of us were going to pay him a visit. Before I could recover my feet the next roll drove my accompaniments and I with equal force against the other side. I think I hear you say where was Capt. C all this time, just looking on laughing heartily, his excuse for not assisting he could not risk spoiling his good razor by throwing it down. In the hurry fortunately I escaped all but the water. I often think of Mary’s weakness in her limbs, if she was here she would be obliged to find strength in them. Our Lat. 43-48 S. Long. 122-54. 12 o’clock bright sunshine, had thought of going on deck till I heard it was very cold. Capt. Gray killed a large porpoise before dinner, the liver of it was very nicely dressed and put down on the table. I tasted a small bit from curiosity and would not know it from sheep’s liver. The sailors consider a porpoise a great treat they say it eats like beef steak but drier and coarser. A sheep killed today so good it would not disgrace any market. My Skye maid is to make the haggis tomorrow, she equals Lezy Taylor at them. Macfarlane still in a melancholy mood, he complained to Capt. Gray that J.B.S. was making a game of him, the little woman was so astonished she would scarcely believe he would say so of her. The same strong favourable breeze continuing, ship going at an average from 8 to 9, miles an hour; all night very cloudy threatening rain, the thermometer up to 60; this is higher than we have had it for three weeks. The carpenter when pumping the ship this morning brought up some sand from the bottom of the vessel, one of the emigrants who saw it said it was easily seen we were drawing near land when the sand was coming into the ship with the water, we could not see that two weeks ago. Capt. Gray says it is time to look about us if the ocean has become so shallow. When we were at our wine after dinner today Flora Kennedy would be rising with you by candlelight to clear out the dining room. How often we speak and think all you are about; I have no doubt you are often employed in the same way about us little thinking I daresay of our sad bereavement; dear little lamb if she had her teething well over I have little doubt she would be alive and well now. The other children are all so stout and healthy. Susan seeming to have forgot the taste of good milk, she takes her porridge with the preserved milk for some time as well as ever she did at home; she sits down every evening with the big bairns to her tea and roll, for dinner she takes soup, rice and sauce and occasionally a bit of meat, she is stout and rosy. Lat. 43-40 S. Long. 127-12 E.
Beautiful bright day blowing a hard but favourable gale. About 8 o’clock this morning, squall with a heavy shower of rain which obliged them to furl one of the sails. We have had a fine run since yesterday. At 12 noon to 12 today 204 miles, we are in lat. 43-51 S. Long. 131-56 E. Some of the emigrants are much afraid we have passed New Zealand, we are so long of arriving, their remarks are very amusing, one old 79 pensioner from […] who was 20 years in the regiment is quite an oracle among them, he certainly shews he has doubled the Cape more than once. I am giving the last mending to John’s surtout that it will bear. Colin quite whole as he has worn it as much as his brother; it is too cold for their french shirts. Louisa has fairly worn out her dark silk, she is wearing her crimson velvet, it looks well with a clean pinafore; she has still two of her prints clean; my saxony is my constant wear it is most useful and black cap equally so. J.B.S. being to be rather ill off for caps, she envies me my black one, she wears an old black merino and a shawl handkerchief, on Sundays, she puts on an old black silk. A collar keeps a long time clean here, I wear mine a fortnight without being at all dirty. Macfarlane still the same. Capt. Gray to oblige him to come up to the cuddy refused to send his meals down below to him, he comes to dinner but prefers wanting his breakfast to coming up for it. A tremendous row tonight again between the 1st mate and Mr. Macdonald’s culprit (I mean the sailor to whom he gave the Bible) the rascal got hold of the mate because he had found fault with him when both were up in the rigging and threatened to throw him overboard. The Capt. gave him a sound drubbing with a stick and hung him for an hour by a rope round his waist over the ship’s side to clean the chain plates near the waters edge. Then he was pardoned. A very strong breeze in our favour with occasional showers of heavy rain. Emigrants say we are so long of getting to Van Dieman’s land they are afraid Capt. Gray has passed it by and may miss New Zealand in the same way. We are today Lat. 43-58 S. Long. 135-32 E. I forgot to mention that we have a Venetian and Russian on board as sailors, the former is the cleanest and best behaved sailor in the ship, the latter is the dirtiest, both speaking a little English. Busy in the evenings giving the children their Saturday washing and looking out clean clothes for tomorrow. Curious how reconciled the children are to the ship, they never ask when they are to see land except Colin. I am certain John will regret leaving the Blenheim. It is a great blessing they’re all so stout and healthy. Capt. Gray expects it to blow rather hard tonight. Rather a gloomy morning, it cleared up about 10 o’clock. A beautiful breeze as fair as it can blow, a firm strong breeze last night carrying us along 9 miles an hour. The sea was more luminous last night than I have seen it yet. I sat a long time at my cabin window, I never saw anything more beautiful, you would fancy the sea was covered with large balls of fire. Had public worship as usual, heard John his questions etc. sat a long time on the poop, too much motion to walk, we expect to be only another Sunday on board. Our lat. 44-8. Long. 148-11. Macfarlane is much better, for two days he has attended all his meals in the cuddy. We expect to see Van Dieman’s land tomorrow evening. Capt. Gray expects to pass within 5 miles of the land. I do not think that I mentioned that J.B.S. work is knitting worsted stockings, last week she turned a tartan frock for Duncan; her daughters are very idle particularly Catherine she does nothing but read except while giving lessons to the children and occasionally some slow worsted work, she fiddles at. It is alleged by other young men that Dr Sutherland is looking sweet at her; they have a great deal of joking among themselves about it. Dr Sutherland is the smallest man, except Jimmy Macdonald, I ever saw and very plain looking; he is generally in very high or low spirits, speaks very like Christian Tait, he has been well educated but not by any means I should think a clever youth; he is much more of the gentleman than Dr Campbell, his father was a respectable proprietor in Caithness but was obliged to sell his property; he has two brothers in the Company’s service in India. So much for for Catherine’s beau. His fortune is between £400 and £500 and 100 acres of land. Dr Campbell may be a good doctor but you never would think so from his manner, he speaks with such a Highland accent and expresses himself so ill, you would think he had not spoken English till he was at least twenty. I must say he is most attentive to his duties and most obliging; we have always found him particularly so at all events we have not a very polished party, we have what is better a very merry and social one. I forgot to say Dr Campbell tho not so little as Dr S is very small likewise and plain looking. John Cameron looks a giant beside them, he is both tall and stout and very wise in every respect. A fine fair morning but cold, a favourable breeze carrying us on about 7 miles an hour, everyone on the qui vive expecting to see land, a constant lookout from the mast head. Capt. Gray on making up his reckoning at noon found he was further south than he had expected, consequently we will only see land from a great distance. 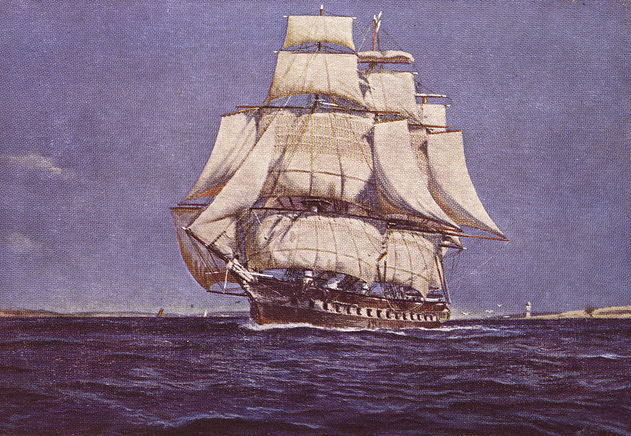 About ½ past 12 there was a cry from the mast head of land in sight, shortly afterwards those with sharp eyes could see it from the deck; you cannot fancy what a sensation this caused amongst the people who for 16 weeks have seen nothing but sky and water except the desert island of Trinidada. As we were about 30 miles distant I only saw the land like a dark cloud, it was the south part of Van Dieman’s Land. Capt. Gray says we would be in Hobart Town last night if that had been our destination. While off the land in the evening we had heavy showers of rain and the smoothest sea since wwe left the tropics. We were delighted to find Capt. Gray was quite correct in his reckoning. 6 o’clock the land more distinctly seen, some of the gents saying it was like the port of Ardnamurchan. We have only been 32 days from the Cape to Van Dieman’s land an unprecedented quick passage; we have not been 34 days without an adverse wind, this is looked on as quite extraordinary. A beautiful morning, much warmer, the favourable breeze still continuing tho not so strong as we have become accustomed to, still we are progressing 5 or 6 miles an hour. A woman delivered of a son last night, this makes the sixth child born on board and all very fine, thriving children; this woman with all her former confinements had long and difficult labours, yesterday evening she did not feel herself very well, the Dr. desired her to go into the hospital, she thought they would have plenty of time to remove after she was taken ill, however matters came so quick upon her that the child was born before she could be removed; Dr. C was very angry at her and no wonder, think how unpleasant for him going about her before so many women and married men who sleep in the same place; to crown all not one stitch had she prepared for the child, it was rolled in an old petticoat of the mother’s. She is a carpenter’s wife from Skye. All the other women had their baby things so neat and tidy, particularly the low country woman; they come up on Sundays so clean and dressed some of them in white frocks and nice little hoods. Macfarlane is much better, he has been seen to smile once or t\twice at table does not now trouble capt. Gary with his confidential commentations. Today our lat. is 43-23 Long. 149-18. Went up on deck at 2 o’clock beautiful warm day, very little wind, ship making very little way I am sorry to say, beginning to think of our packing, hope to be in New Zealand on the 22nd. 6 o’clock very little wind almost a calm. After tea the Capt. killed with a hook and line 6 large albatrosses, one or tow of them measured 10 ft 8 inches between the tips of the wings, some of them, almost pure white were beautiful birds they are very valuable on account of the quantity of down on them. We have had the most glorious sunset this evening I have yet seen, as I cannot do do it justice in the description I will not attempt it. Bye the bye I mat well mention that it is as well J.B.S. and I are to separate soon, I do not think that she would continue long good friends, when she is in bad humour she is so rude in contradicting me in any opinion I offer as if she must know better than anyone; I never came in contact with so ill-tempered a woman; I really pity her husband, I have heard him at times say sharper things to her than I could think him capable of, she can make herself pleasant enough when she chooses and did so for a long time after she came on board. A beautiful bright morning, there is a light breeze not quite fair; in the morning at 12 o’clock it became more favourable; for 35 days we have had a fair wind till today, the fishing for birds commenced early, 3 monomoths were caught before breakfast, this is a bird very like the albatross but smaller; one beautiful large albatross was caught likewise. Capt. Gray has some of the emigrant women busy plucking the birds on deck. I have been ransacking my repositories for some duds of clothes for the little stranger that made his appearance the other day; it has been in the mother’s coarse petticoat. Our Lat. 43-33 Long 151-57. J.B.S. in very good humour she wishes evidently to be very agreeable to me to make up for some very disagreeable words we had last night; you will laugh when you hear one of the arguments we had was about the roasting of mutton, she said she never had mutton roasted without plenty of butter rubbed into it, I said I never used it unless the mutton was poor and dry from from being long kept, she said mutton must be dry without butter that old Mrs. Macdonald who was such a good housekeeper always used it; she appealed to John Cameron if his mother did not use butter to baste the mutton, he said he was not sure, he thought she did not; I said I knew his Aunt did not, that she had superintended the roasting of a good many joints with me not long since without using a bit of butter certainly not […] was busy with us both during our dispute the gents were all present and highly amused at us. So warm put on one of my ginghams. Fine morning, tho not bright, a light breeze not quite favourable making some way notwithstanding. A very fine sheep killed yesterday just as fat as our Highland mutton but of course will not have the same flavour; one still remaining which is promised to Mr. Macdonald if we arrive in New Zealand in time to spare its life; he will pay at least £3 for it, this does not look like a want of funds. The children at their plum pudding today were calculating they would only have one other on board the Blenheim and that will be on Sunday, 2 days of pancakes, Saturday and Tuesday. The lat at noon 43—32, Long. 154-28 E.
Beautiful bright day, sea as smooth as the Clyde a light breeze favourable, for some days the crew have been employed scraping the masts before giving them a new coat of paint, discovered this morning the fore mast was very much decayed and sprung under the top, the carpenter is putting a piece of wood in where the decayed part was dug out, it will help to strengthen it; this will oblige Capt. 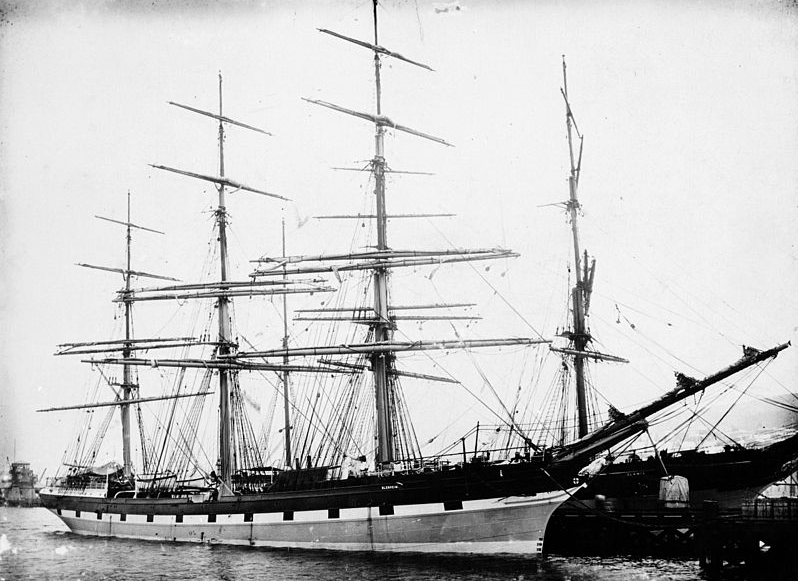 Gray to remain a month in New Zealand to get a new mast put up; most extraordinary it did not give way with the strong winds we had and the press of sail we sometimes carried. Capt. Gray is sure we will have our Christmas dinner on board, he says if we are only making the land on that day he will be so anxious and constantly on the poop he will not enjoy himself. I have been occupied a great part of the day making out a list of every article we have on board, it is a tolerable long list. Lat. 43-3. Long. 157-12. This morning about 2 o’clock I was startled out of a doze by a mouse that was scrambling about the bed, falling on my shoulder, it then got under my night-gown; I nearly went distracted when I felt it creeping on my body, I jumped out of the berth and it required some persuasion to get me into it again; I gave myself great credit for not screaming. You would be amused to see my Skye woman and Capt. C hunting the mouse in the cabin this evening, they got hold of it after a hard chase. Beautiful weather still continuing, neither too hot nor too cold. Thermometer at 8 o’clock this morning was up to 65, a light but favourable breeze all night and still continues; ship as still as if it were at anchor. Our cannons, which amount to 4 were taken out of the hold today (except one which is always on deck) to get them in readiness to fire a salute on casting anchor at Wellington. Capt. Gray applying to J.B.S. and I for old flannel petticoats to make cartridges; I told him mine were too good to use for such a purpose; it is so warm we are sitting with all our cabin windows open. Lat. 42-35 Long. 161-12. J.B.S. very busy packing all day. I proposed beginning on Monday, on saying something about it Capt. Gray said none was allowed to pack till just about to cast anchor, that packing early was sure to bring on a foul wind. J.B.S. proposing taking her things down again for fear of reflections. Great preparation in steerage of bonnets, caps, gowns etc for landing. Our party will not give the New Zealanders a high opinion of Highland beauty; I never saw so many very plain looking. A beautiful morning and warmer than yesterday or since we left the tropics; a light favourable breeze. You cannot fancy what a change to us the ship going as quietly as if she was at anchor from the tossing we were accustomed too all the way from the Cape till we sighted Van Diemans land. Public worship as usual. John busy at his questions. Lat. at noon 41-59 S. Long. 164-26. Constant betting and calculations when we shall see the first peep of New Zealand. My better half busy calculating our distance etc. every day even Mr. Macdonald begins to understand and take an interest in lat. and long. A beautiful bright day, breeze very light but favourable; so warm, thermometer up to 66 in the Capt’s cabin with the windows open. If the climate of New Zealand is at equal to this it must be delightful; of course the land is much warmer than we have at sea. Both my domestics busy today cleaning out my cabin, washing down the paint on the sides and roof, determined to deliver it up in good order. I got, by Capt. Gray’s orders, 3 gallons of water for this purpose; intend to have the boys’ cabin scrubbed tomorrow. Forgot to mention some time ago, looking over old papers in the scritoire discovered a contract of marriage between Duncan Campbell, Capt. C’s great grandfather and an ancestor of Miss Nellys and Florence Cameron either a daughter or widow of John Cameron younger of Calcutta. It is written in such an old curious style I could not make more of it out; the date is 1739. If you ever see Miss Nelly tell her of this. 6 o’clock almost a calm, ship only going 2 miles an hour. Lat. at noon 41-26. Long. 167-11. A beautiful day, Capt. Gray complaining of the want of wind, afraid the change of Moon on Wednesday may bring a gale. We expect by that time to be in Cook Straits where it will be anything but pleasant to encounter bad weather.This forenoon a great many whales in sight, some of them came so close to the vessel I could have tossed a biscuit on their backs, even I, blind as I am, saw their mouths and the air holes through which they blow the water quite distinctly; they were sperm whales, Capt. Gray said some of them must have been at least 80 feet long; the children were astonished beyond measure at their size and the noise they made spouting up the water; even Susan called out there was “Jemmy Ducks”, this is a Bogie they tell her lives in the sea. At dinner, quizzing Mr. Macdonald at the figure he would cut driving his sheep and four hens he has bought from the Capt. into Wellington. Capt.C saying he would have plenty of shepherds for his stock. Louisa in deep distress at having lost a purse given to her by the carpenter for a kiss; it was made of the skin of the foot of an albatross; by Colin’s advice she tied a line to it and towed it out the cabin window and of course lost it. J.B.S. getting her cabins cleaned out today. The emigrants are to be roused at 4 o’clock tomorrow morning to clean out their places; there has been much scraping of the ship decks for two days. Lat. at noon 40-2. Long. 169. 8 o’clock breeze freshened so much that the ship is going 8 to 9 knots an hour, expect to see land early tomorrow. Boys for some days in their french shirts, very angry with John came in with the knees of his trousers covered with tar, he got off one of the boats. Would not allow him to go on the poop all day. Colin is always so neat and tidy. A beautiful morning, rather cloudy, a delightful favourable breeze carrying us along from 7 to 8 knots an hour; the ship made great progress during the night. Capt. Gray turned all hands up in the steerage at 4 o’clock to commence the scrubbing, such a chattering and noise as the women made. The largest shoal of porpoises about the ship Capt. Gray ever saw; the 2nd Mate killed one, Capt. Gray speared another; the line broke and carried off the harpoon sticking in its back, it must have died immediately. This is the second harpoon lost in the same way. A cry of land at about ½ past 10 o’clock, everyone in such a state of excitement so anxious to get the first peep of land of our adoption. It was Cape Farewell on the north of the South Island; it appeared to be very high land. we soon lost sight of it. Cooks Straits are 80 miles broad at the entrance. We have fairly entered them. The sea is quite green in colour. Capt. Gray hopes top anchor in Port Nicholson tomorrow afternoon if the breeze continues as it is at present. The land we saw today was so far off that we could only see the outline. Lat. 40-18. Long. 172-24. Capt. C had his straw hat blown overboard tonight. During the night we had a strong favourable breeze. 11 o’clock the ship lay too still, 3 o’clock in the morning when the day begins to dawn, Capt. Gray took this precaution because he had never been here before and the Straits are so narrow in some parts that the navigation is rather intricate. Just when the moon changed last night a very sudden squall came on, it was violent while it lasted. Fortunately it didn’t continue long from the ship laying too, we felt it more I confess I felt very anxious and often wished myself out in the blue water again. Capt. Gray sat up all night, he seemed very anxious, this place is so subject to sudden gales of wind. This morning almost calm, great fears spring that we will not cast anchor today. About 11 o’clock a smart breeze sprung up to our great disappointment right ahead of us; we have been tacking all day and making no progress. Capt. Gray says with this wind it will take us 4 days to make out Port Nicholson, a fair wind would bring us there in 6 hours; this is very tantalising, we are about 60 miles from our destination, we have had land in sight on both sides all day; about 7 this evening we came within about 8 miles of the North Island; it is very high land and very precipitous. Near the coast we could see large trees on the tops of the hills altho there were none on the side next to the sea. A large butterfly (of course a New Zealand one) was seen on board the ship; we smelt the land quite distinctly this evening and saw fire on shore. I have been busy packing all day. Capt. Gray quite disconcerted that we will not be able to enjoy his Christmas dinner from not being at anchor. 8 o’clock the breeze has died away completely, it is a complete calm. A beautiful bright sunny day, so warm cannot bring myself to think this is Christmas Day. A very light breeze sprung up about 11 o’clock against us. Capt C saying we may be a week of anchoring. All very merry at dinner; a favorable breeze came on about 6 o’clock which, with a good allowance of wine, put the gents in famous spirits. A lovely evening, went up on deck to look at the emigrants dancing, they got some grog to keep their Christmas. Capt. Gray expects to anchor tomorrow at breakfast time. Sat up til 11 o’clock at which time the vessel had just got through the narrows and lay to for the night. When we went to bed last night it was blowing a light breeze, a beautiful starry night; judge of our astonishment on awakening this morning to find it blowing very hard gale right against us. Capt. Gray mistook another bay for Port Nicholson; instead of anchoring as we expected at 9 this morning we were obliged to pass Port Nicholson and were drived out 30 miles from the land; it was quite one of those storms Pollock describes as so frequent in the straits; altho blowing so hard not a cloud was to be seen in the sky and the sun shining so bright. I was dreadfully alarmed, if we had been in the open sea I would not have minded it. I dreaded one of the sudden shifts of wind that Pollock describes, likewise which might drive us on the shore; my fears got so much the better of me I believe I afforded great amusement to the gentlemen. The gale commenced at 2 o’clock this morning. Capt Gray thinks it will moderate about that time. A beautiful mild morning, just as Capt. Gray expected. The wind went down and changed in our favour about 2 this morning. The Capt. is in rather a dilemma about finding out the harbour; there is not proper chart of it published; he is not sure which of the bays it may be. Very stupid of the Company not to have some signal put up to show the proper entrance. Went up on deck after breakfast, we were off the bay thought most likely to be the proper entrance. To make sure the Capt. lowered a boat with six hands, they were to make a signal if they found we were in the right place; besides this we had five cannon fired with the hope of bringing a pilot to our assistance. Before the boat had gone any distance from the ship Somes Island and Wards Island were discovered from the masthead which made the Capt. so sure he had at last found the proper place that he made sail into the bay. You may fancy the state of excitement we were all in, the children calling out everything they saw or imagined they saw; Louisa even the length of saying she heard the New Zealanders speaking. At length a ship was seen at anchor which was the first symptom we had of being near Wellington The town consists of a number of small houses some wooden and some thatched, both on the sea beach and a few on an elevated plain behind. We were much disappointed at the wild appearance the country presented. The Bay is so very extensive t would contain the British navy and more, and surrounded on every side by hills wooded to the top. The climate would be delightful but for the high winds that prevail. I am told a very short way inland the weather is much milder that you would scarcely feel a breath of air when blowing a hard gale in the harbour. We counted 12 ships of all sizes at anchor before the Town. The moment our anchor was out a number of boats came off from the shore to us. Some of the gentlemen were very superior in appearance and manner to what I expected to see. We were much disappointed to find that the Surveying Department had been slow in its operations there was no chance of getting our sections for some time, even those who came in the [Royal] Merchant have not been provided with theirs. Our land will be 80 miles from Wellington at Wanganui. To make up for this we are told by all who have seen that part of the country that the land is more level and much easier cleared. Indeed the fine harbour at Port Nicholson is all it has to recommend it. Up the river Hutt about 8 miles from Wellington there is very fine land but heavily timbered and of course a great expense, the clearing of it from being so near the chief town where there is always a demand for everything it will pay the expense well. Some of the natives came on board dressed in European clothes. As I have brought the ship to an anchor I will now close my journal. Our proceedings from the 27th I will give you in a letter which I will dispatch by the first ship which sails and that I hope you will receive long before this comes to hand, as I intend sending my journal home by Capt. Gray and he returns by Manilla and China. I hope it will afford you some amusement,I have been very particular in putting down everything, as I knew nothing would be too trifling to interest you. I have enclosed for your amusement an invitation card I got to a Ball. Now that the voyage is over I must say I thought very little of it, and were it not for the severe trial we met with I think I would have even enjoyed it; to be sure we were most fortunate in weather, ship and Commander; to give you an idea how attentive Capt. Gray is, from the Tuesday we entered Cooks Straits till we anchored in Port Nicholson on Sunday he never went to bed; he is rather blunt in his manner, I always liked him and found his most attentive and kind, were it nothing more than the love he had for the dear little lamb who is no more I would always feel a deep interest in his welfare. Sometimes he and Mrs. Macdonald were rather sharp to each other, she always brought it on herself, I have heard her say very rude things about him; I never saw a woman with less common sense or less command of her temper. I will give you an instance of her rudeness. We had very fine English ham for dinner so there would not be enough to go over all the cabin passengers at breakfast; next morning there were only a few slices put down for the ladies. Donald, who is very fond of good things no sooner spied the ham than he asked for some; Capt. Gray said there was none for him, his wife called out “ O yes Donald there was some ham but I suppose Capt. Gray wishes to keep it for himself, so from my sitting next Capt. Gray I had an opportunity of seeing that he would be the last man to do anything of the kind. I have seen him help about soup and not keep a drop for himself. And now my dear Mother and Sister I will bid you goodbye and may God bless you.